A very early start today for the sixty odd mile drive over to Wast Water. Its less than half that distance as the crow flies but, as we’re not crows and with plenty of big fells to skirt around between our start and end points, we’re up and about by 5.15 am and on our way by 6.00 am. The morning brought cloudless blue skies and the extra early start brought traffic free roads so we made good time and were parked up in the National Trust car park at Overbeck Bridge just before eight o’clock. 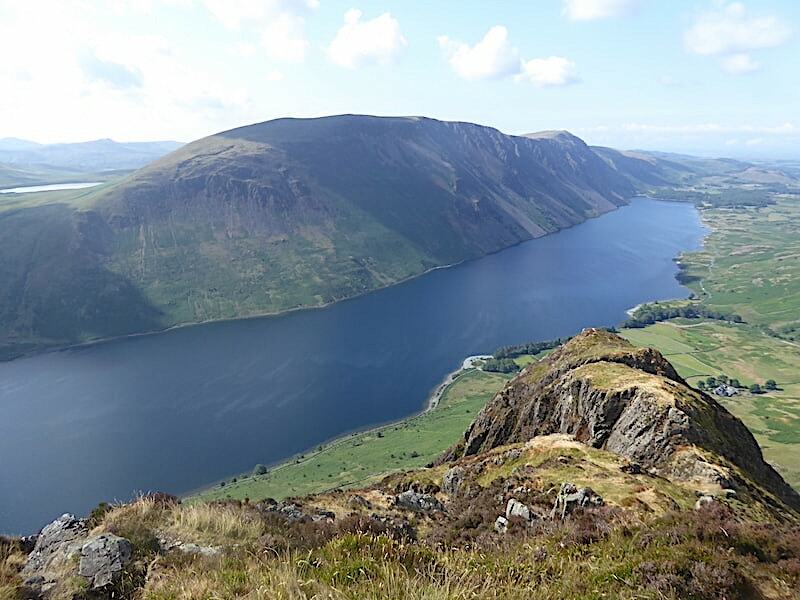 We’d brought breakfast with us and, having munched our way through it and washed it down with mugs of hot coffee, by 8.15 am the car was locked, packs were hoisted and we were on the path from the car park and on our way up to Yewbarrow. 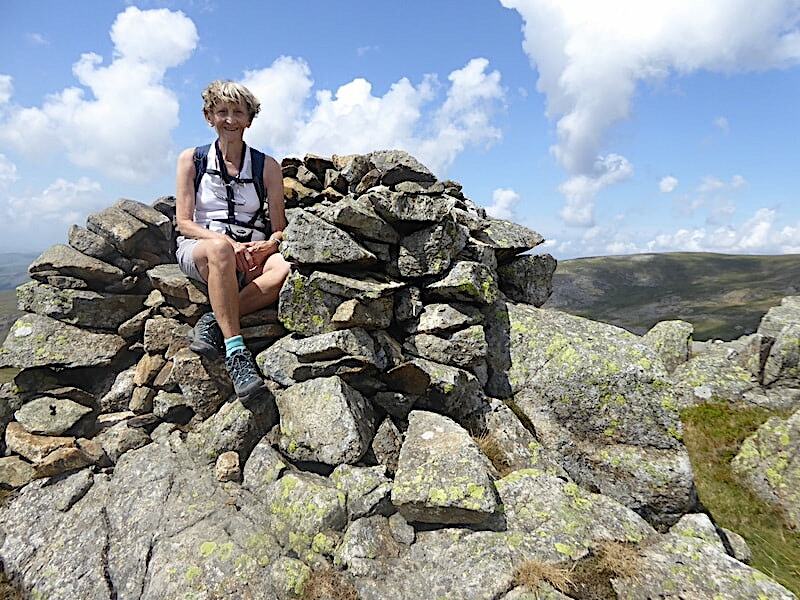 A few weeks ago we resolved to return to some of the fells which we haven’t walked for a very long time and the two fells we’d be tackling today were part of that resolution. A handful of others still remain on the list but we are hopeful that by the end of autumn we will have brought them in out of the cold too. 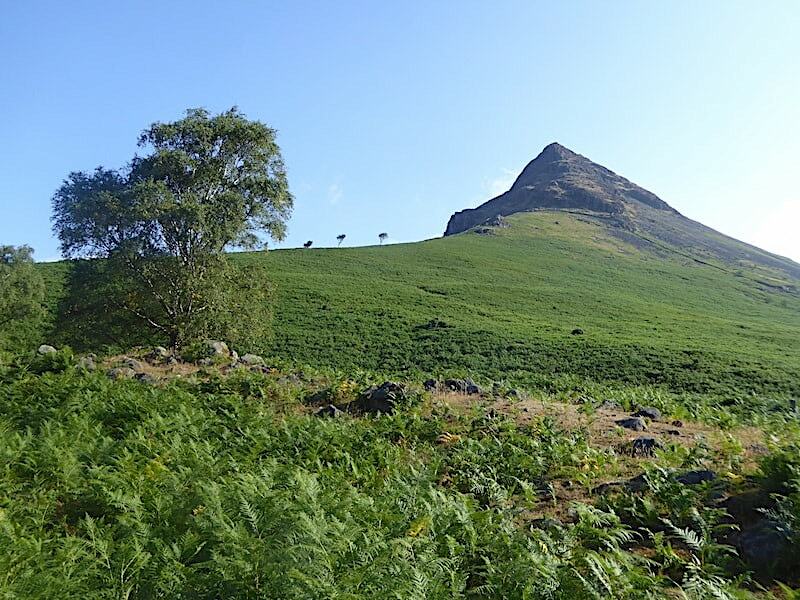 Yewbarrow silhouetted against a cloudless blue sky as we climb the path from the car park, a light breeze stirs the air occasionally but even so its still quite warm. 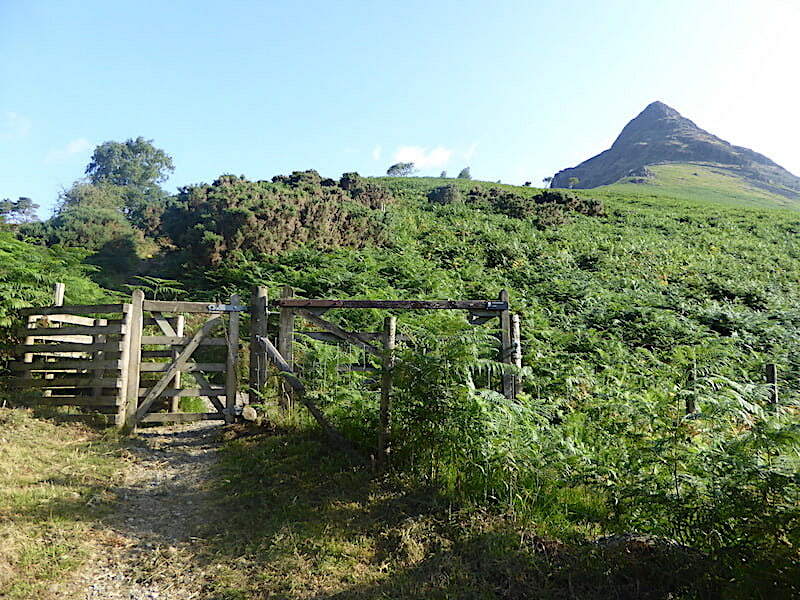 The first gate along the path, which is soon followed by a second, which in turn leads to a step stile across the fence. 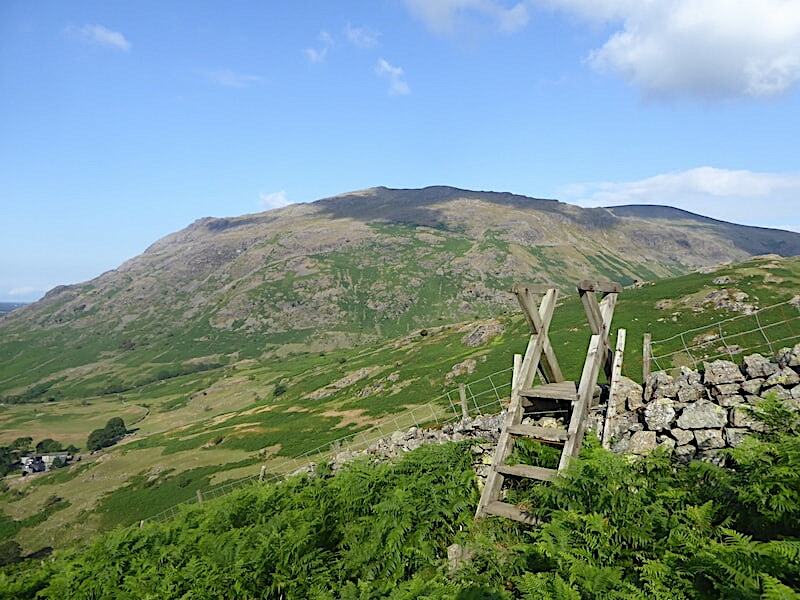 We go through both gates but do not cross over the stile and then begin …..
….. the long, steady and steep climb up to the ladder stile just below Bell Rib. Thankfully the bracken hasn’t invaded the grassy path. In the full glare of the sun we are soon in need of a mop round but a search in my pack revealed that my handy little towel wasn’t inside. Not as serious as forgetting to pack the drinks but a nuisance nevertheless, because now I’m having to use the tissues I have stuffed in my pockets and the slightest amount of moisture sees them disintegrating into something resembling confetti. I can’t even use a sleeve since I’m wearing a sleeveless top, oh well, I’ll have to make do with using the lower part of the top. In a little under thirty minutes we reach the ladder stile beyond which Middle Fell, with Seatallan behind it on the right, can be seen. We take a brief break here and take in the views, all the while hearing whooping and hollering coming across from the slopes of Middle Fell as a farmer seeks out his sheep. J looks along Wast Water, the surface lightly rippled here and there as the slight breeze drifts over the surface. The screes are still in the shade so the drama of them is a little muted at the moment. We resume our walk, cross the wall via the ladder stile and follow the steadily rising path towards Dropping Crag, seen on the left of the shot. 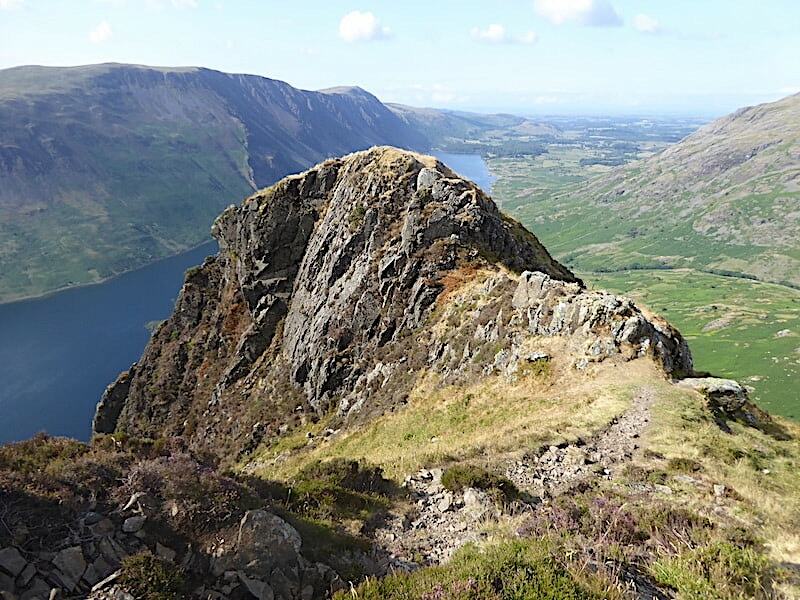 The dramatic sheer wall of rock on the right is Bell Rib, a feature of Yewbarrow best left to skilled and experienced climbers, being neither of those things the delights of Bell Rib will forever remain unknown to us. Hmm, I notice the cloud is coming in from the west and beginning to build, that wasn’t supposed to happen until later this afternoon. 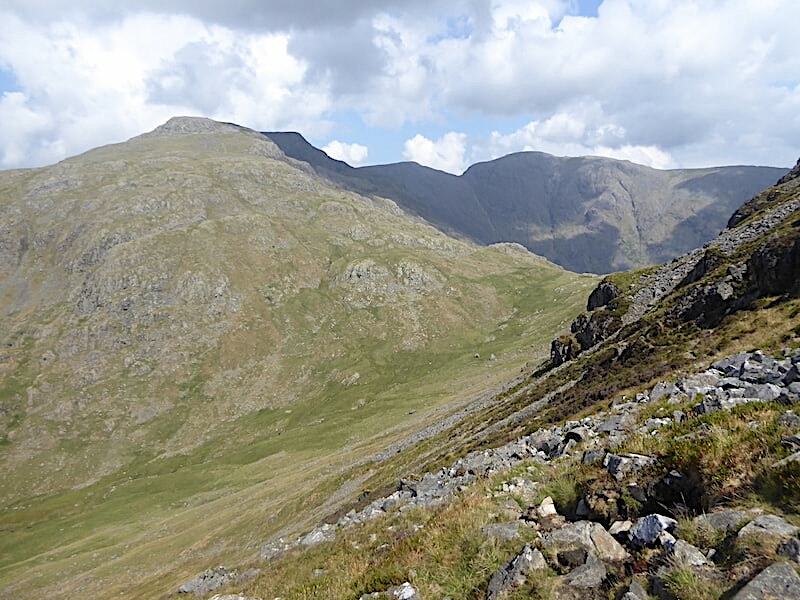 Approaching Dropping Crag and where this still shaded side of the fells provides some relief from the sun’s intensity. We weren’t in full sunlight again until we reached the ridge line and that made the climbing a lot less sweaty and a whole lot more comfortable. The path was very dry and dusty and littered with small stones which resulted in a slither or two but by and large it didn’t pose any problems. 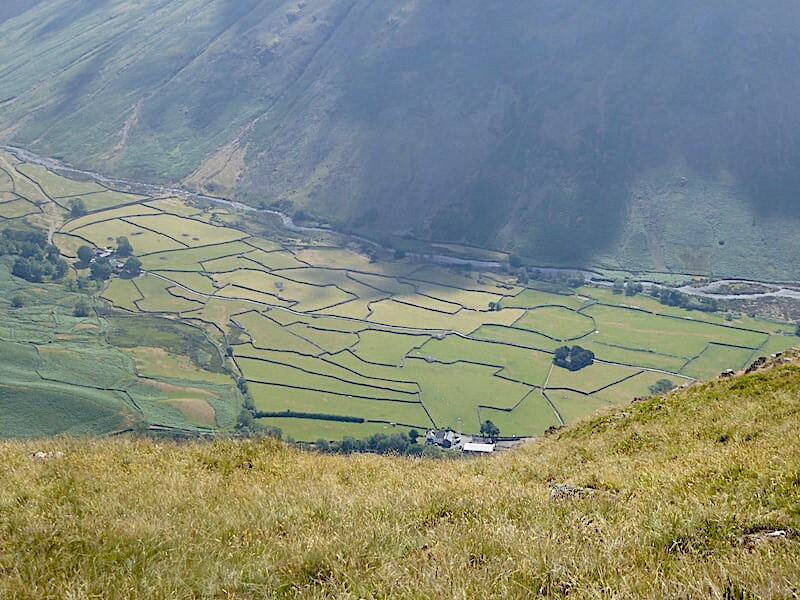 A look back to Wast Water and the fields of Wasdale as we arrive at the foot of Dropping Crag. 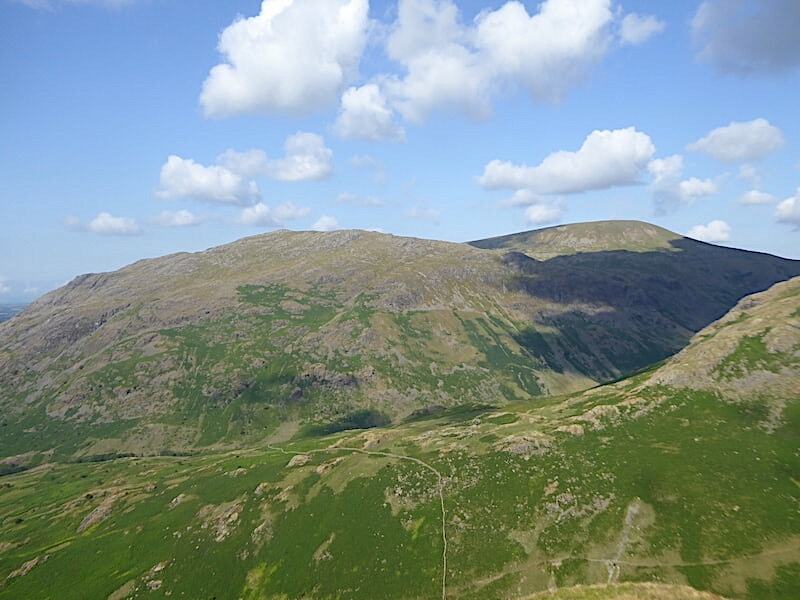 The sun has risen high enough now to illuminate some of the more prominent crags below Ill Gill Head and Whin Rigg. 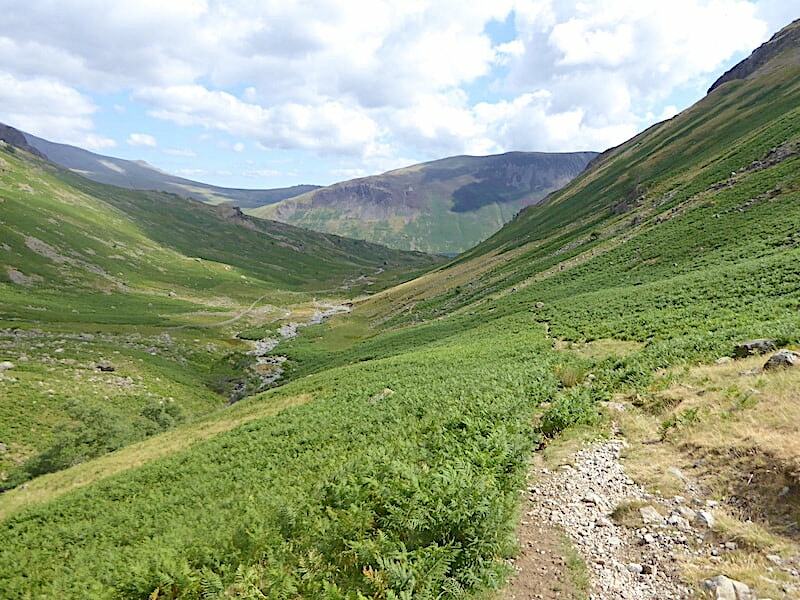 The tree lined gully below contains Over Beck flowing down into Wast Water from the lower slopes of Red Pike. Over to the left of us is a band of scree but a pitched path leads away from it to the right and that’s the route we follow. 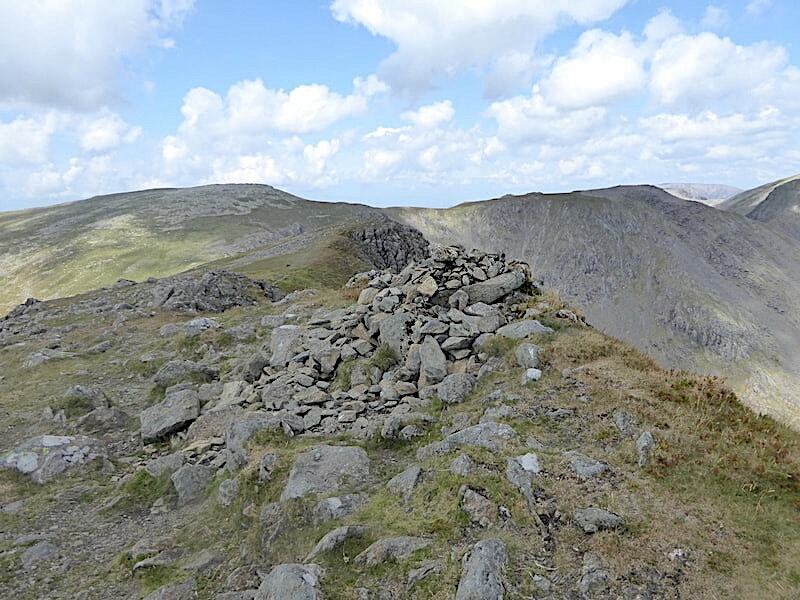 However, it isn’t pitched all the way and eventually reverts to being loose and stony once again all the way up to …..
….. the gully. Its a longish scramble and as the walking poles are more or a hindrance than a help in such places they get packed away. The loose stones and rocks in the gully bottom are a bit of a pain but the scramble itself doesn’t hold any real difficulties. There are plenty of hand and footholds although in a couple of places I was back to wishing I had longer legs as some of the step-ups were a bit on the high side. No matter, knees come in very useful in such situations. Needless to say J has no such problems his legs being a good few inches longer than mine. On the minus side though he’s a lot less bendy than me so that evens things out I suppose. J emerges from the recesses of the gully, tries to straighten up and slithers back an inch or two on the loose path. I remember saying something about it which made him laugh but quite what it was escapes me now. 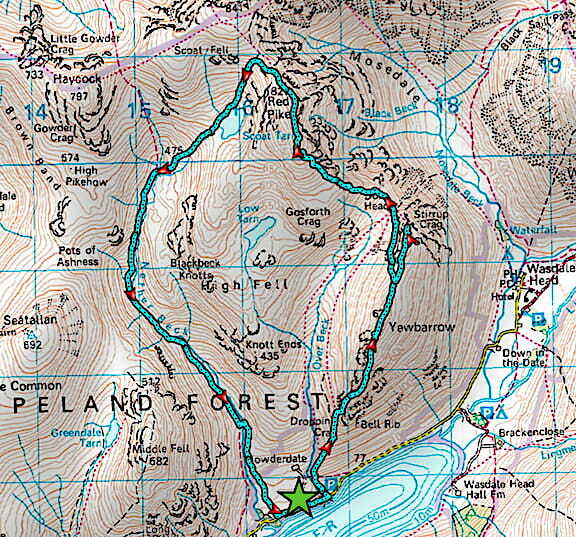 There’s a choice of routes once out of the gully and we follow the path leading off to the left. 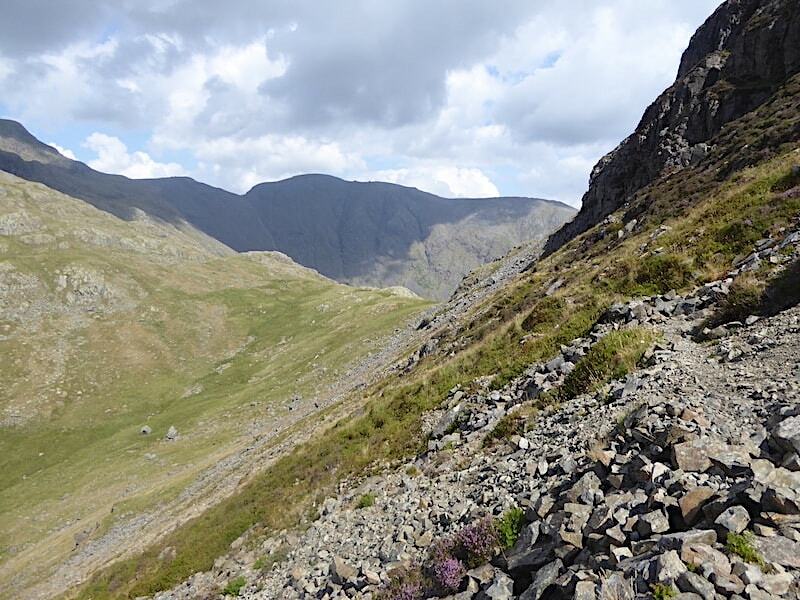 The one to the right leads up another very steep scree chute which rises through the crags and comes to an end at Great Door. 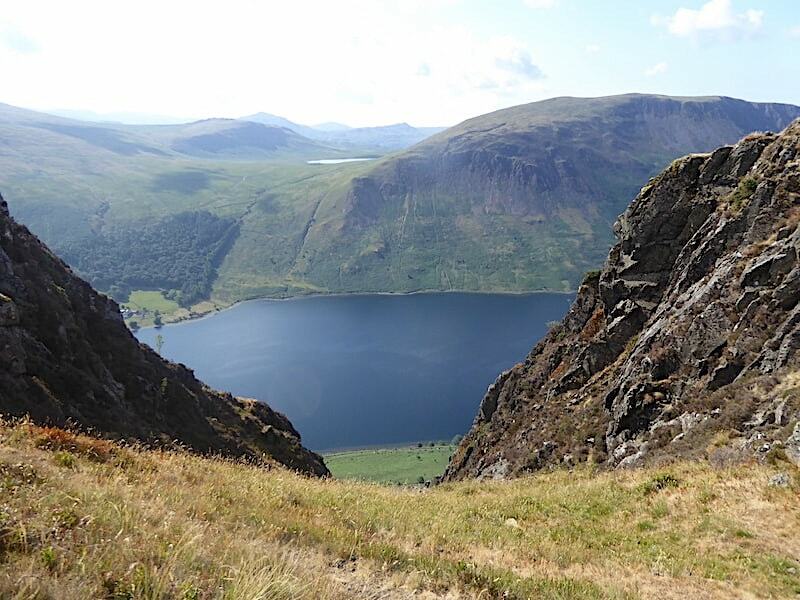 Great Door is an enormous cleft in the crags which offers some very vertiginous views down to Wast Water. 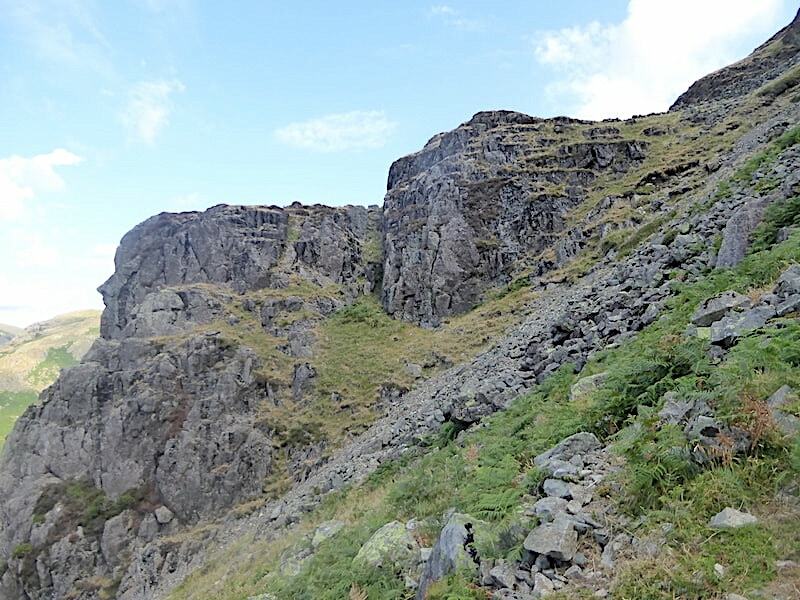 The path we follow takes a route around the back of all the crags and rises very steadily, across some gentler slopes, up to the ridge line on a slightly wider, but still quite stony, path. 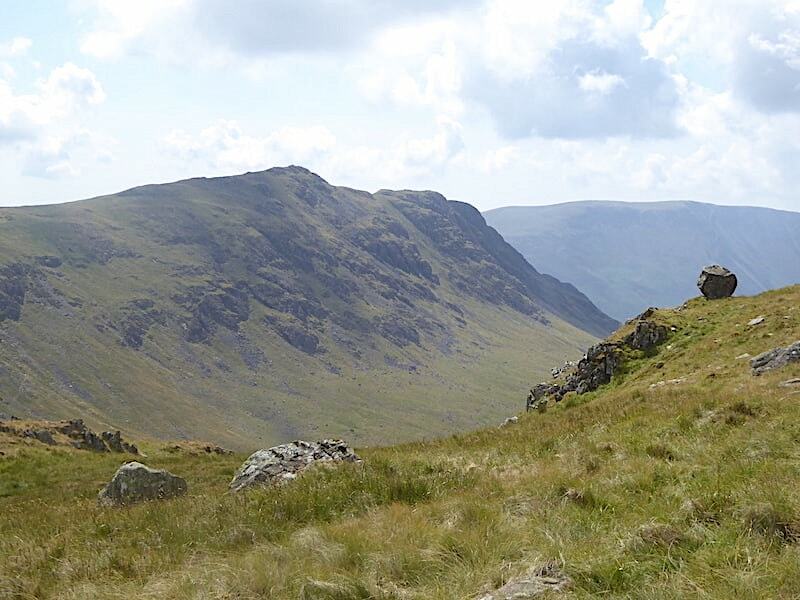 I meant to take a shot of the route ahead of us but forgot to take one so the only shot from the walk to the ridge line is …..
….. this one, looking across the Over Beck valley towards Middle Fell with Seatallan just behind it. Ten minutes or so later we are back in the sunshine as we reach the ridge line path at a point which could be mistaken for Great Door. 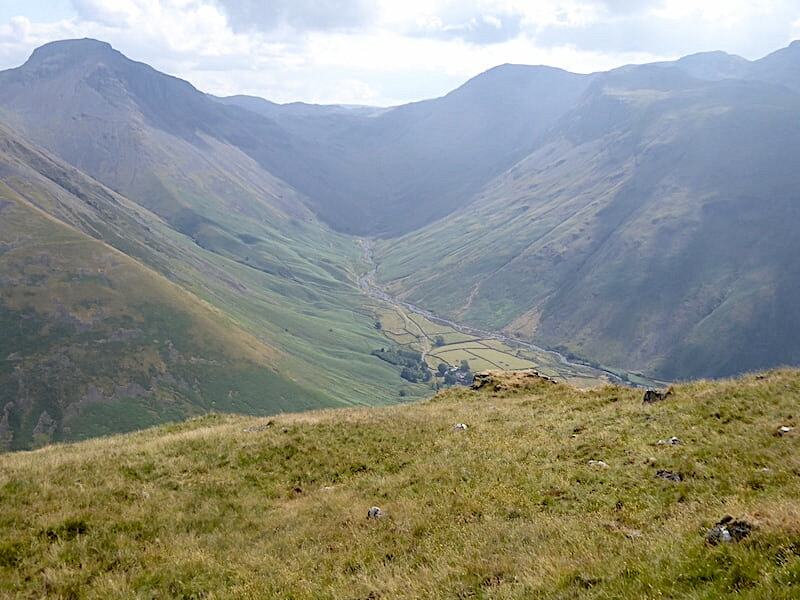 It isn’t Great Door, it is the second cleft in the crags which fall precipitously down to Wasdale. The gap is much wider than that of Great Door and the rocky walls are less steeply angled, Great Door has rock walls which are practically vertical. That said, the views are pretty much the same from both viewpoints, from here its a view through a window, from Great Door its as though you are looking through a chink in the curtains. Because we skirted round the back of Great Door I can’t show you a photo but there are plenty available on the web if you want to see the view from it. In the shot above we are looking across Wast Water towards Illgill Head beyond which a sliver of Burnmoor Tarn can be seen. 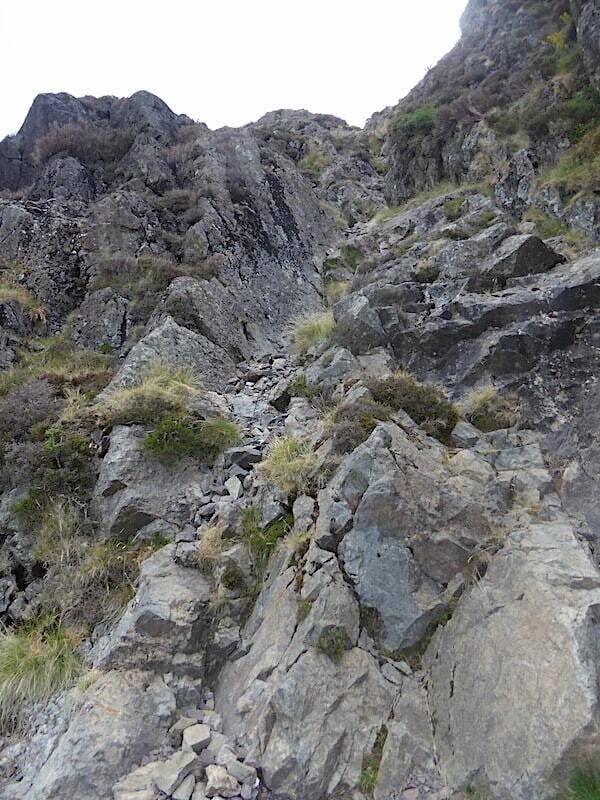 We continue along the path to begin the climb up Bull Crag. When we were far enough along I turned for a shot looking back at Bell Rib. Follow the path back to the point at which it disappears beside the low crags on the right, that is where we emerged onto the ridge line and where I took the previous shot. Higher still and another look back down to Bell Rib where we can now see the deep cleft of Great Door separating the very top of Bell Rib, which almost seems to be jutting out into Wast Water, from the rest of its crags and cliffs. 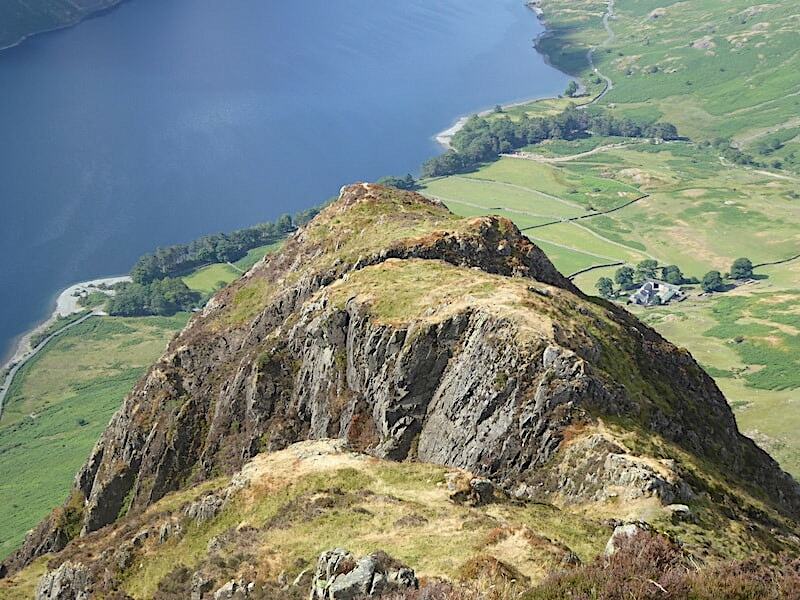 We can see a path leading from Great Door over to the end point of Bell Rib from where the airy views will no doubt be spectacular, but the views from this point are no less sensational, and our legs haven’t turned to quivering jellies either. A closer look back to Bell Rib and the cleft of Great Door. We carry on along the ups and downs across the ridge, we still have more climbing to do with occasional bits of scrambling here and there but the hard work is pretty much over and done with so there’s more opportunity to look around. Good views of Lingmell and the Scafells were not easy to come by this morning, there was some haze around and the sun was directly beyond them so this was the best I could do at the time. 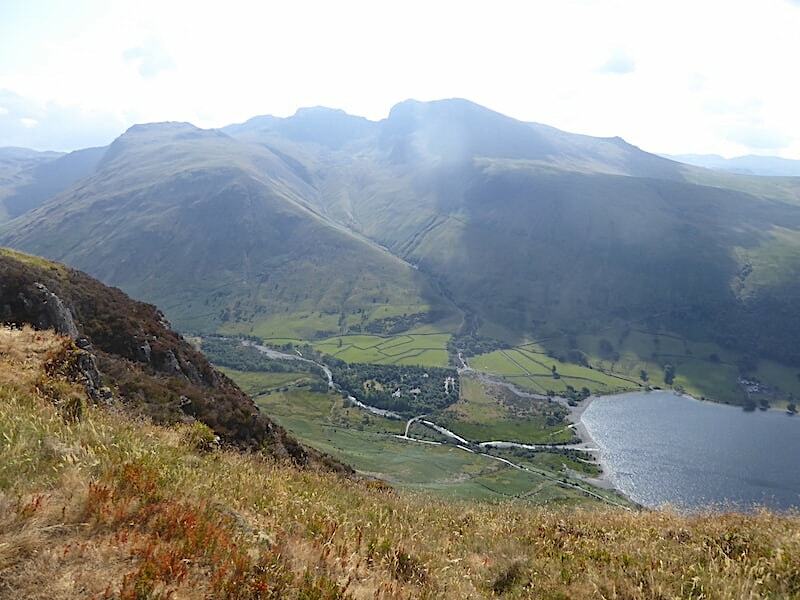 Immediately below us is the head of Wast Water and the Brown Tongue route up to the Scafells. 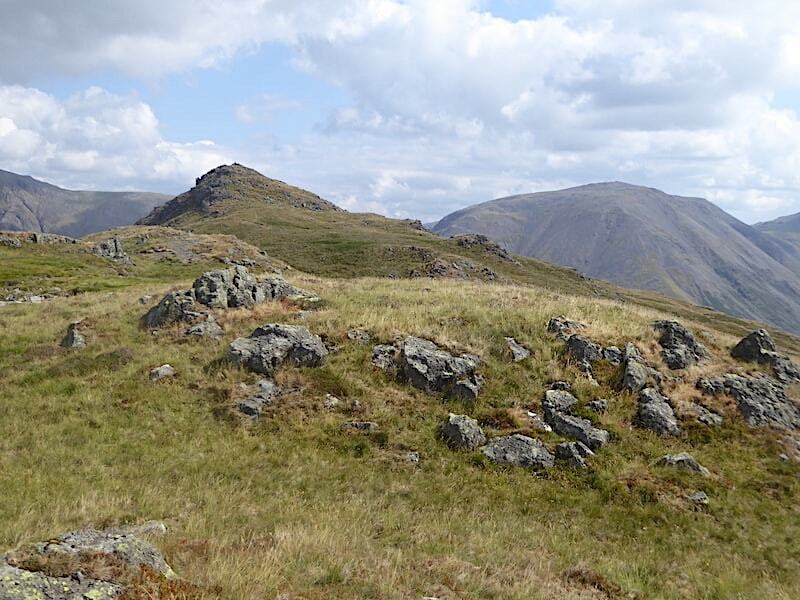 A little further along the ups and downs of the ridge and in the distance the cairn on Bull Crag comes into view. 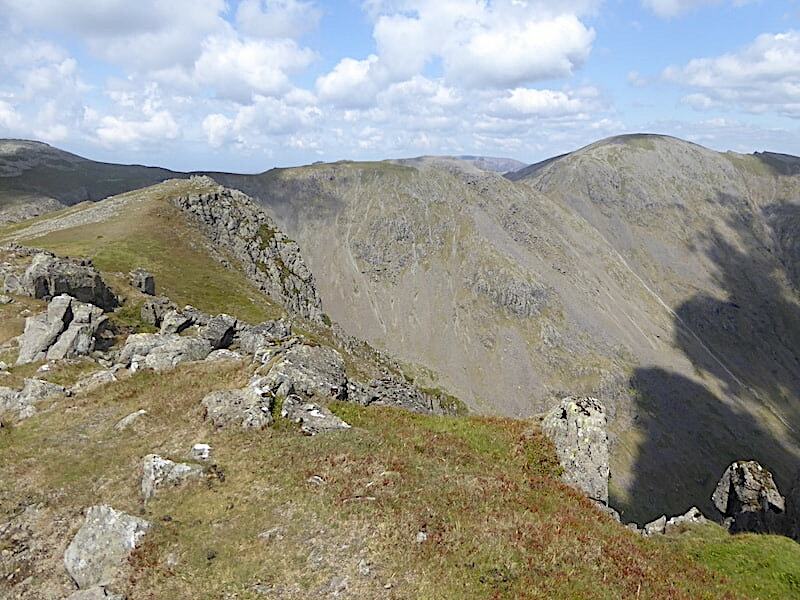 Before we drop down into the dip …..
….. a look to the left reveals Haycock on the left and Red Pike on the right. 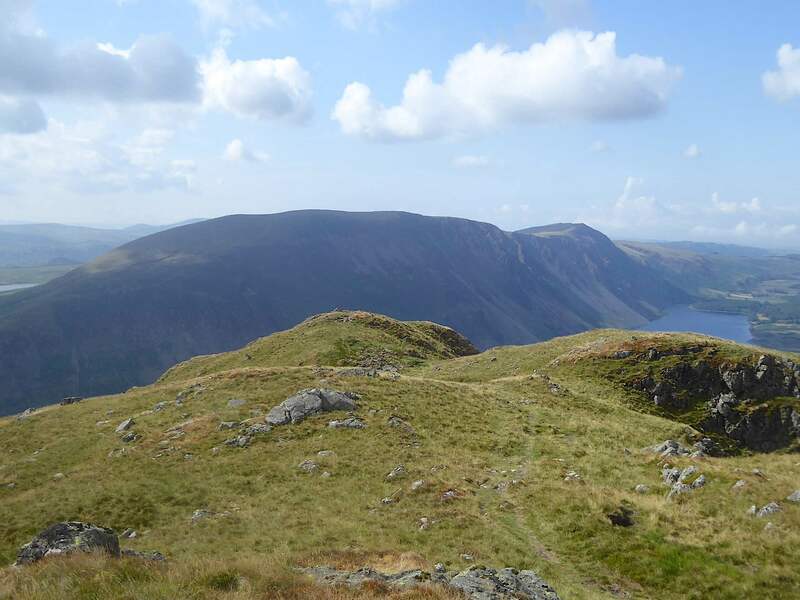 A look back to the cairn perched atop Bull Crag …..
….. and a look ahead across the undulating ridge towards the summit of Yewbarrow. 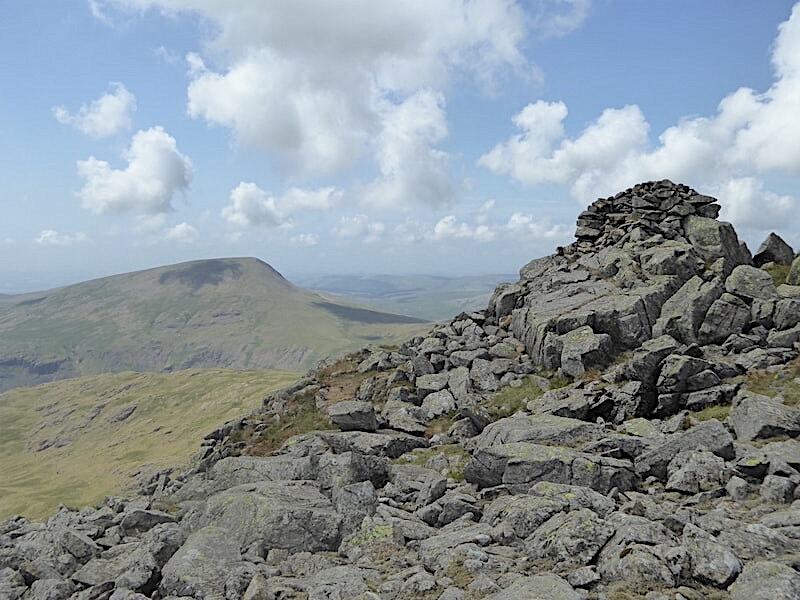 The whooping and hollering coming from Middle Fell has ceased and peace returns. 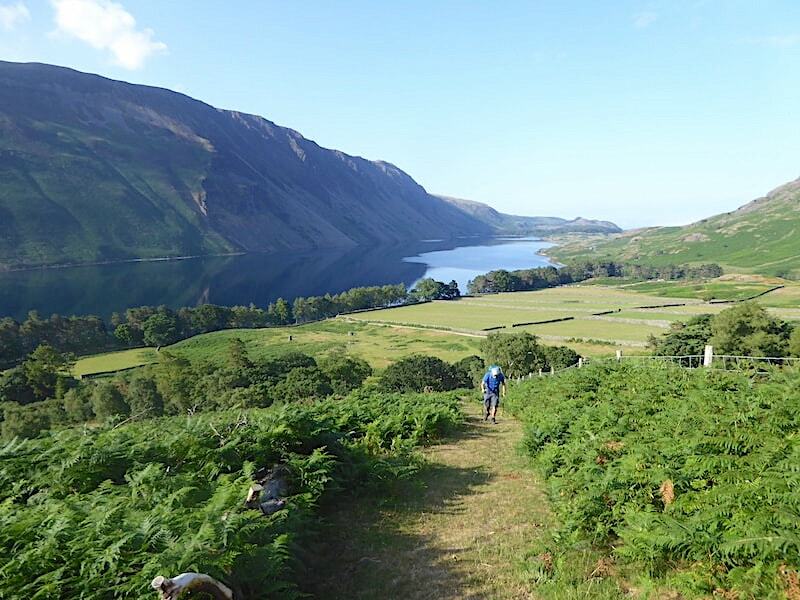 There is no-one else around and we have Yewbarrow entirely to ourselves. The breeze is a little livelier up here but it isn’t a chilly one and it helps keep the temperature at a very comfortable level. We arrive on Yewbarrow summit at twenty past ten, two hours and five minutes after leaving the car park although I have no idea whether that sort of time is par for the course or not. 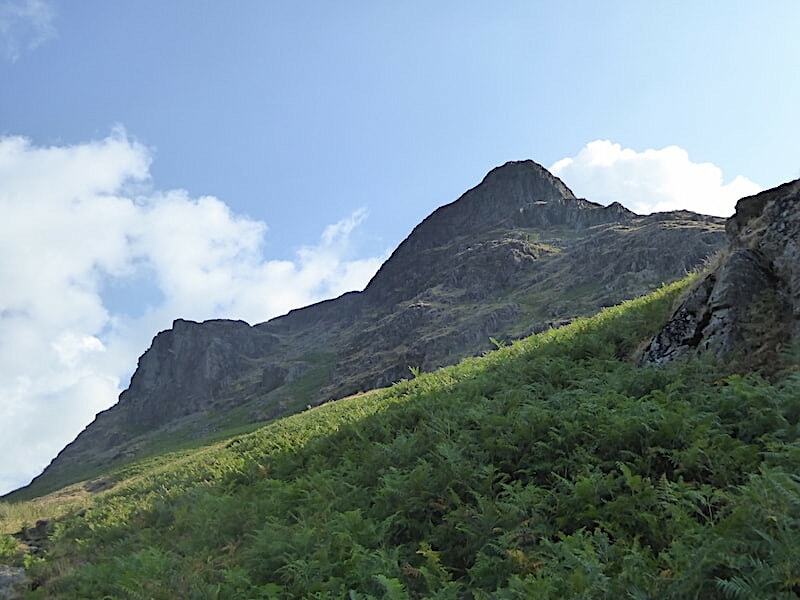 According to AW we have climbed 1900′ over a distance of one and a half miles and anyone with a mathematical disposition may already be working out the precise steepness of the climb. I don’t need to do any sums my legs are telling me that it was very steep and if I could see my way clear to let them have a sit down for five minutes they would be eternally grateful. The gps gave us a summit reading of 2075′ or thereabouts. Its still nice and sunny up here but a look to the west shows the build up of cloud which has plunged Red Pike and Pillar into deep gloom. 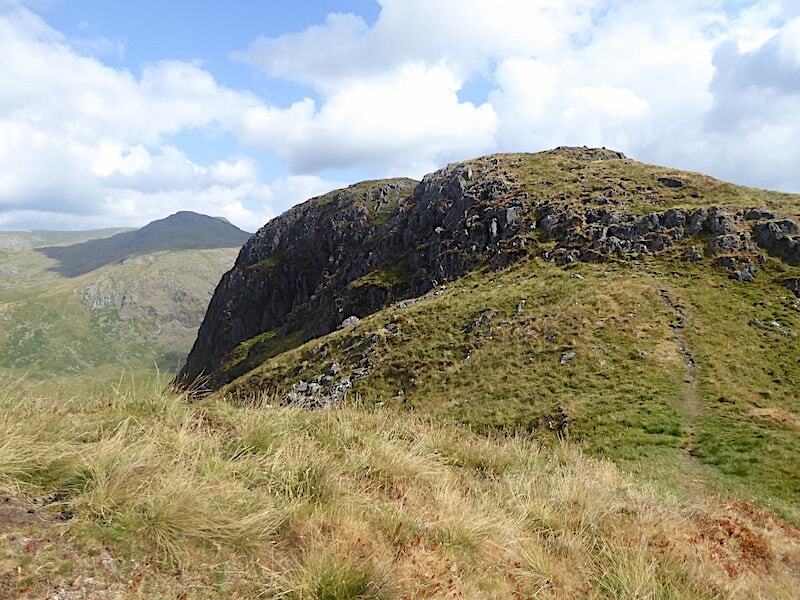 Before the legs get their promised tea break I take a look along the ridge towards Stirrup Crag at the far end, while J indulges in a few moments of fell spotting. The views are extensive but the combination of cloud and haze is resulting in some very murky skylines. 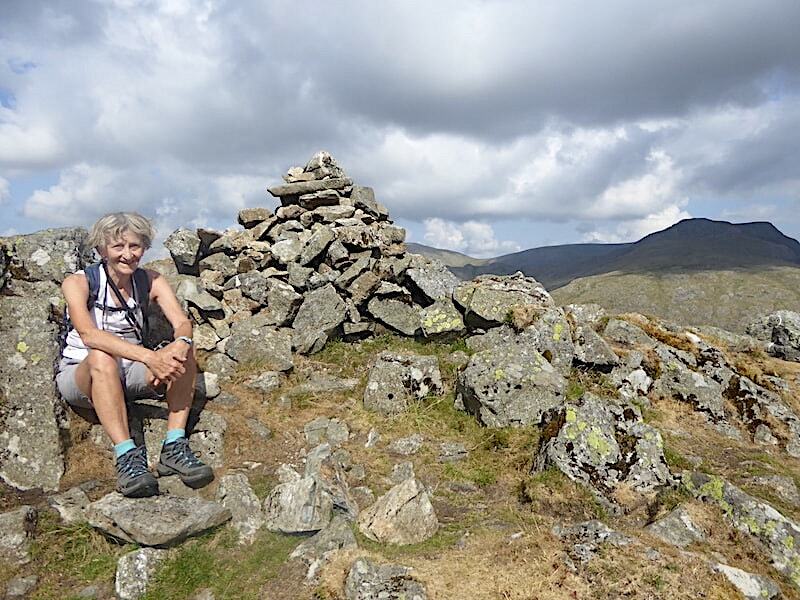 Kirk Fell and Great Gable peep up beyond the summit cairn …..
….. and I nip round to the sunny side of the cairn and have a sit down for five minutes. In case anyone’s wondering, yes I did brush my hair before setting out this morning, so just blame the unruly mop on the lively breeze. 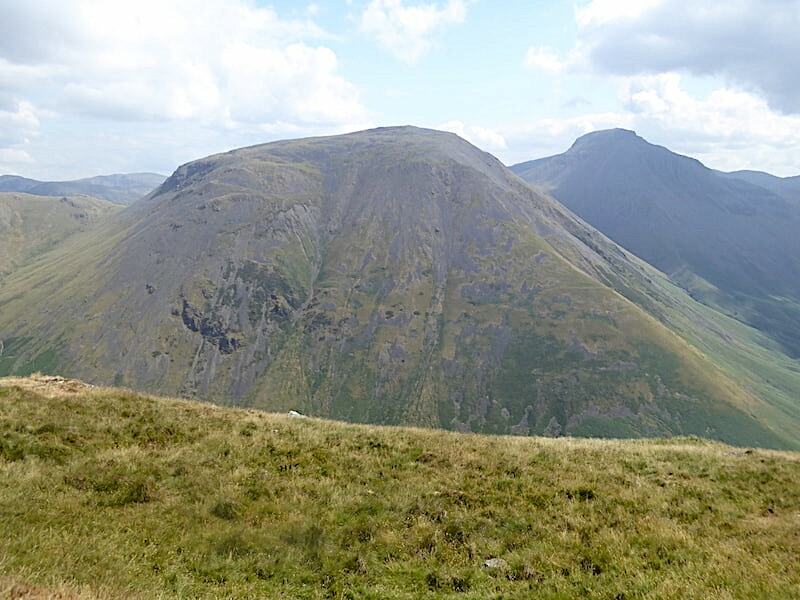 Yewbarrow’s near neighbours, Kirk Fell and Great Gable, are not particularly well defined despite their proximity thanks to the hazy conditions. I tried for a shot of the Scafells but with the sun right behind them it didn’t turn out very well so I haven’t included it. 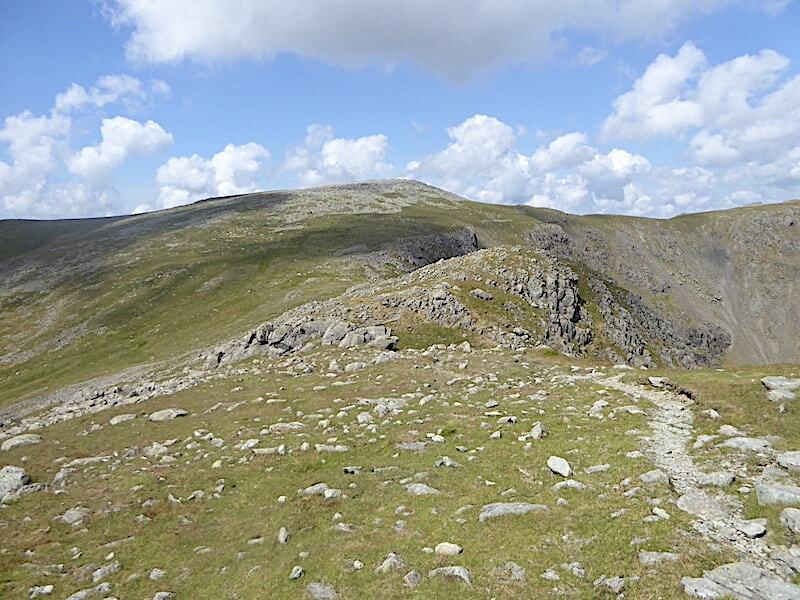 What I did see though as I zoomed in for the shot was a solitary walker on the summit of Scafell Pike. That shot was timed at 10.30 am so he must have had an early start too. The sun lights up Red Pike at last and the thin greyish horizontal line nestling to the left of it is all we can see of Low Tarn at the moment. 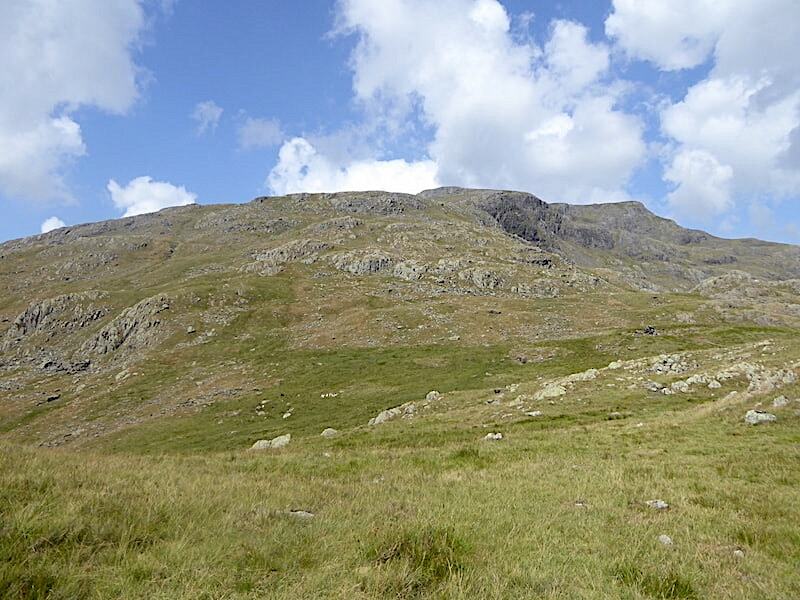 So, we’ve had a short break and taken some drinks on board so we set off along the ridge to pay our respects to Stirrup Crag at the far end. Pillar is still under a cloud and I keep hoping for a sunnier shot of it but to no avail for the time being. 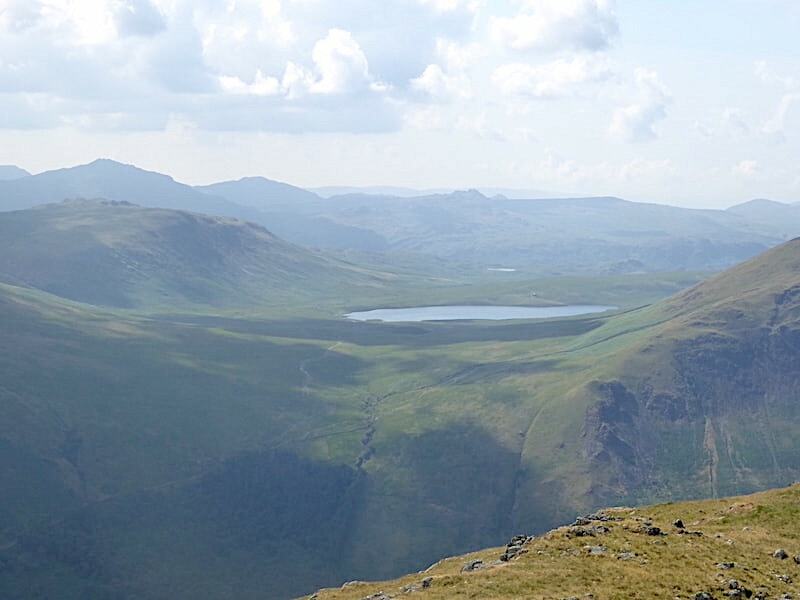 A very hazy skyline beyond Burnmoor Tarn but we can just about make out some of the fells across there, from left to right are Harter Fell, Caw, Green Crag and just the very top of Stickle Pike. With the sun landing directly on the fells to the west the skyline identification is more straightforward, Seatallan on the left, followed by Caw Fell and Haycock. Kirk Fell had a sunny spell so I grabbed a quick shot while it lasted. 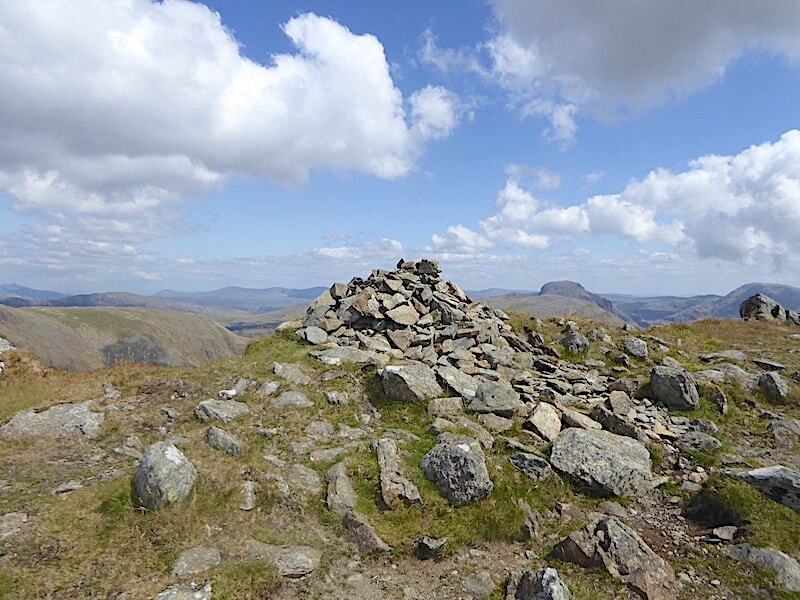 The summit cairn on Stirrup Crag and a very sunny Red Pike behind it. Pillar and its neighbours still in gloom. Have patience, I think to myself, that lump of cloud can’t stay there forever, Pillar will get its fair share of sunlight sometime. Well, not just yet it seems as I point the camera directly at it where it creates a monumental barrier at the head of Mosedale. Not quite a view down to Dore Head but that’s as much peering over the edge as I’m willing to do from this height. 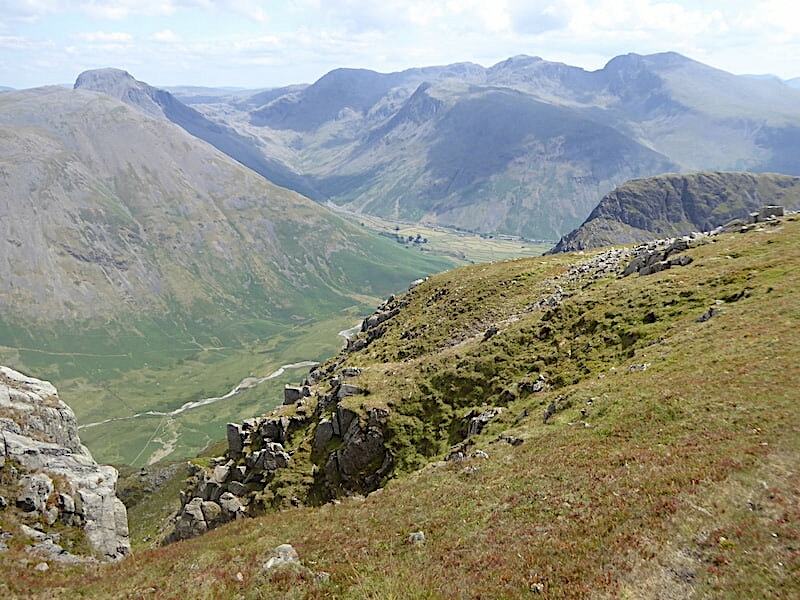 The sunny uplands of Red Pike are beckoning. 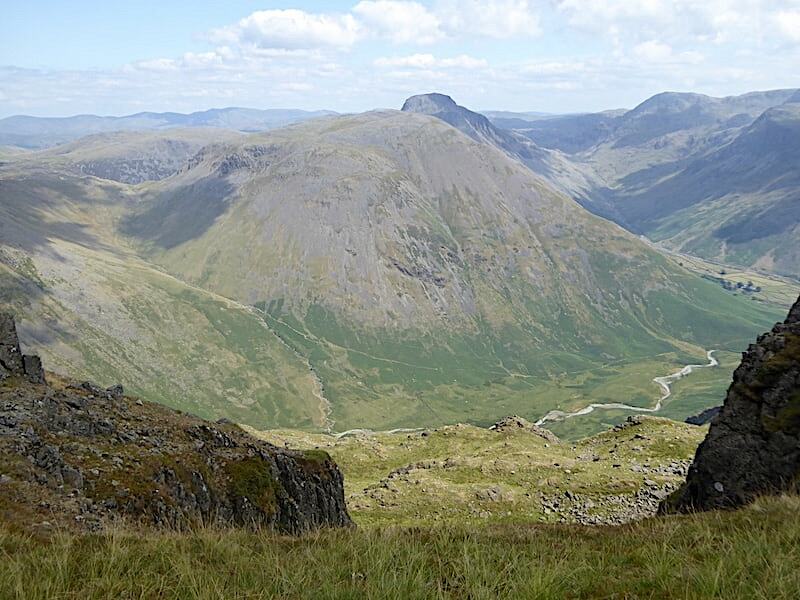 An extensive view along Over Beck from Stirrup Crag with Middle Fell and Seatallan basking in the sunshine. 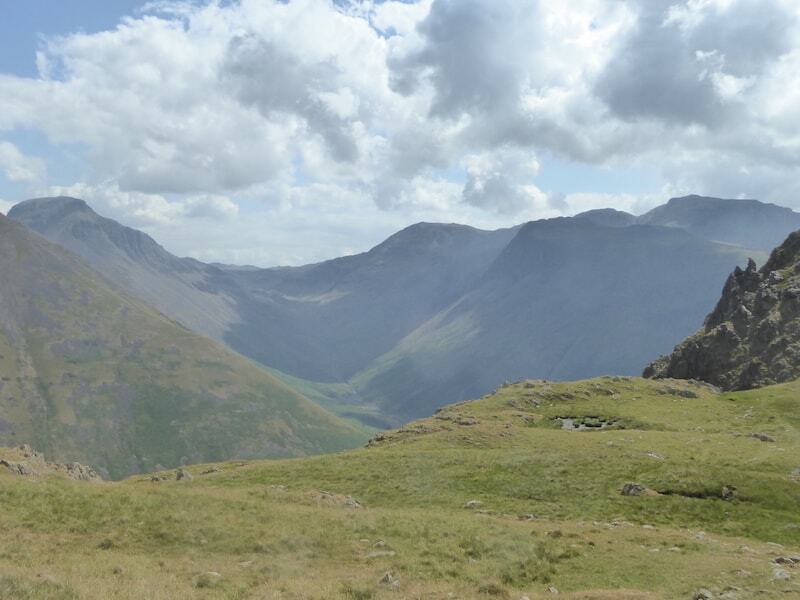 A hazy view down to Wasdale Head, the starting point for a good number of walks. 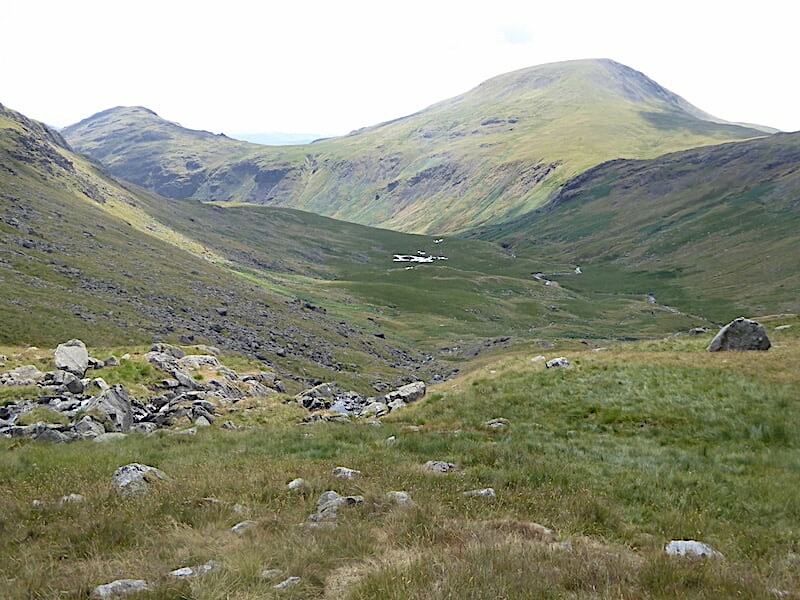 Climbing left out the valley would take walkers up either Kirk Fell or Great Gable, walking straight through it continues on up to the col at Sty Head, while bearing over to the right leads to ascents of Lingmell and Scafell Pike. 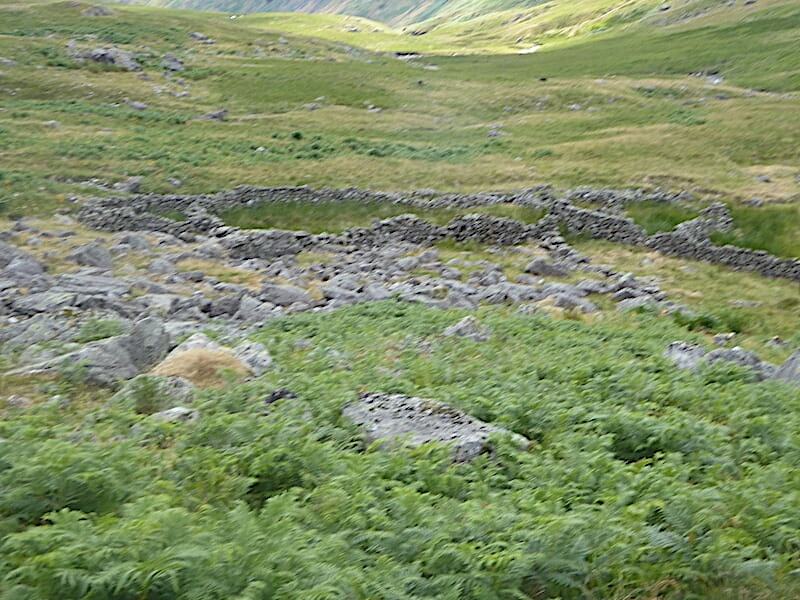 The walls of Wasdale. A good subject for a jigsaw puzzle perhaps? 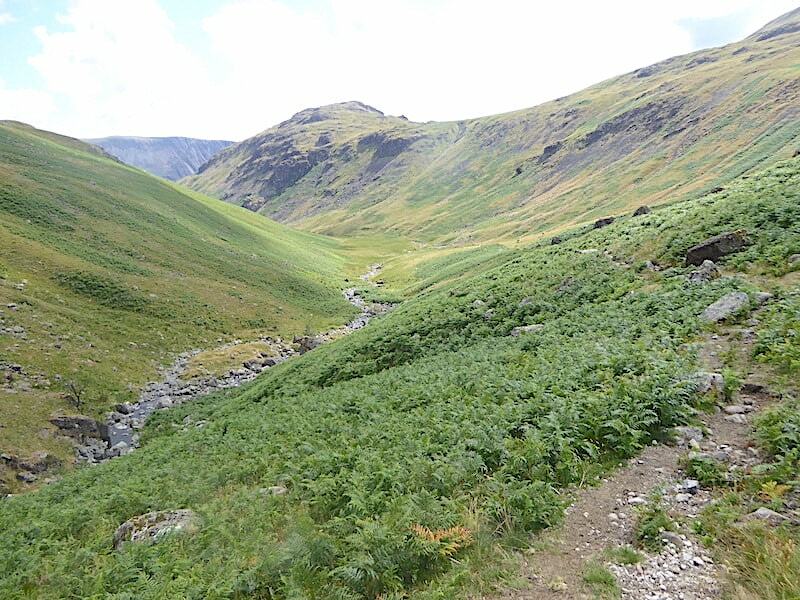 We wander over to the end of Stirrup Crag, peer down into Mosedale and reminisce about walking the path below Kirk Fell leading up to Black Sail Pass. The breeze is keeping us nicely cooled up here but I expect its like being in an oven down there. 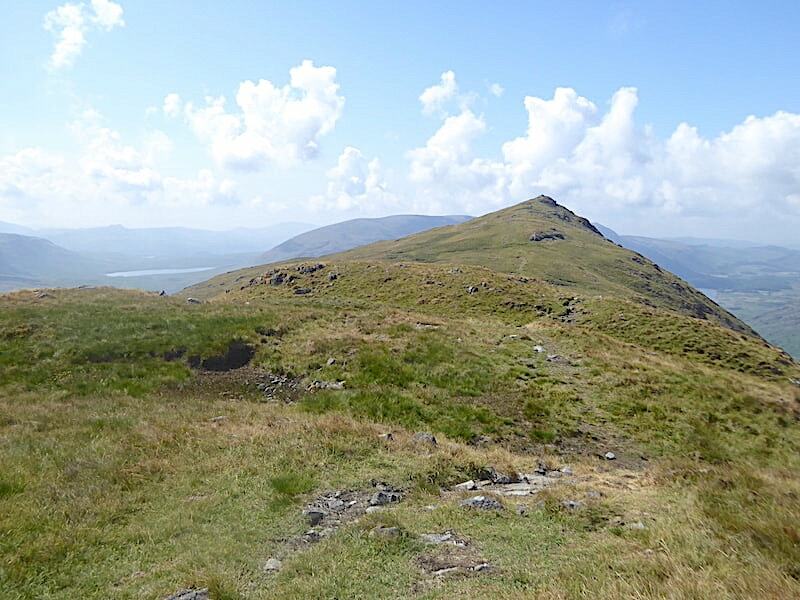 We’ve enjoyed the views from Stirrup Crag but now its time to make our way down to Dore Head and our next objective, Red Pike. 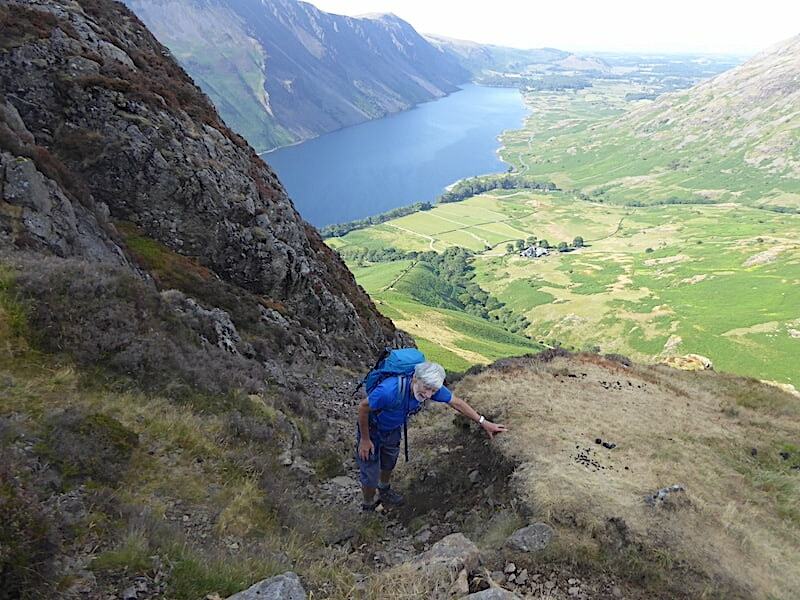 As we started out a couple of fell runners came towards us, more or less out of the blue, so they had probably arrived via the path used by runners doing the Bob Graham Round, which rises up the steep eastern slopes of Yewbarrow from the Wasdale Head road. They both gave us a cheerful greeting as they jogged past us and neither of them seemed to be the slightest bit out of breath. 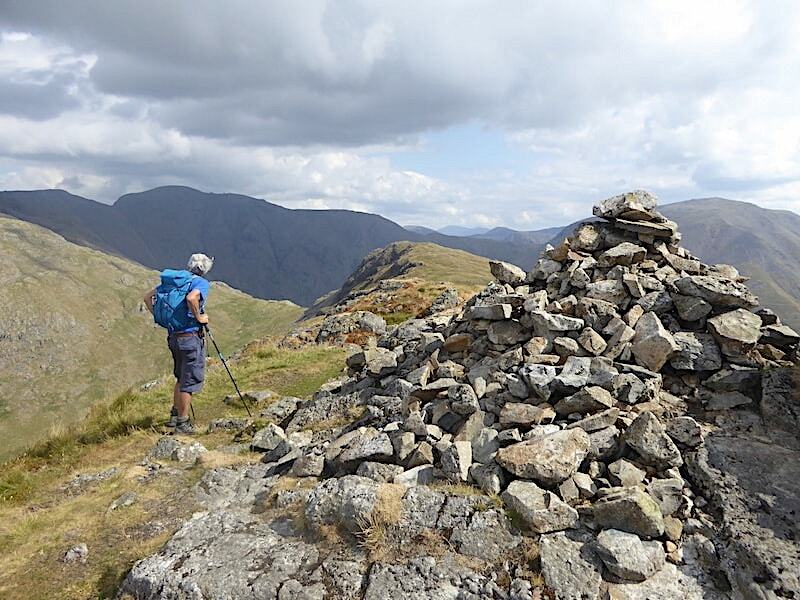 I couldn’t run from here to the summit cairn at yonder end all in one go so I could only envy their abilities. Mind you, they were several decades younger than me. 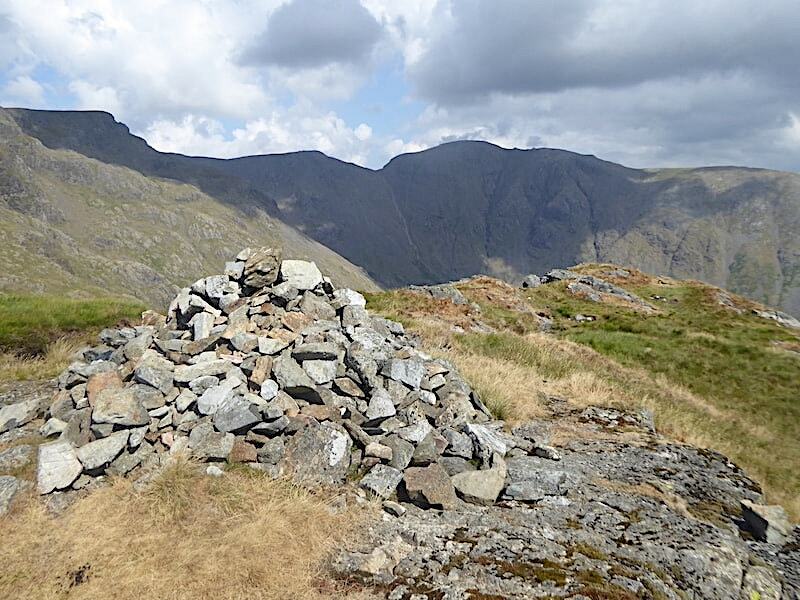 We head back to the depression between the summit and Stirrup Crag where a small cairn marks the beginning of a faint grassy trod leading down to the Overbeck valley. 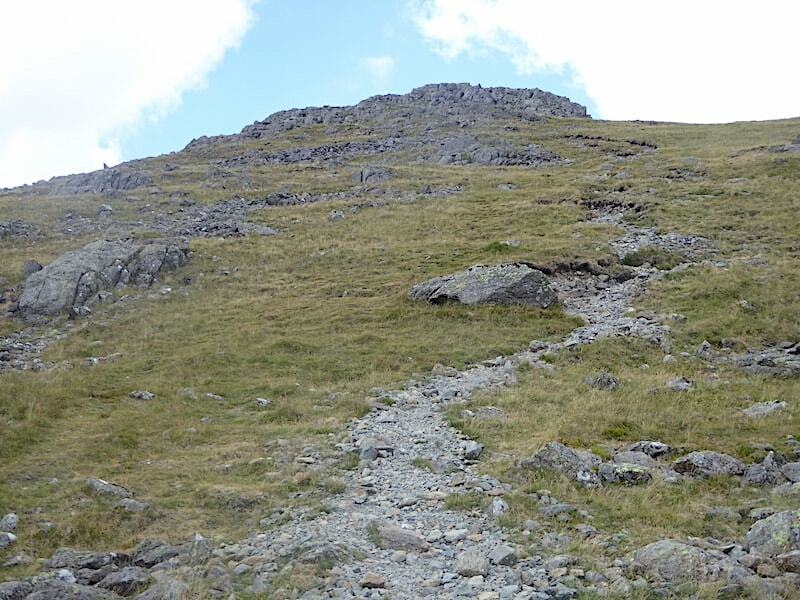 The path, which is generally OK although loose and stony in a few places with a few bouldery patches thrown in for good measure, gently traverses the steep slopes passing below the crags on the right of the shot and eventually it meets up with another path coming across from Dore Head. If we had been returning to the car park we would have turned left at the junction but we were heading for Dore Head so we carried straight on. 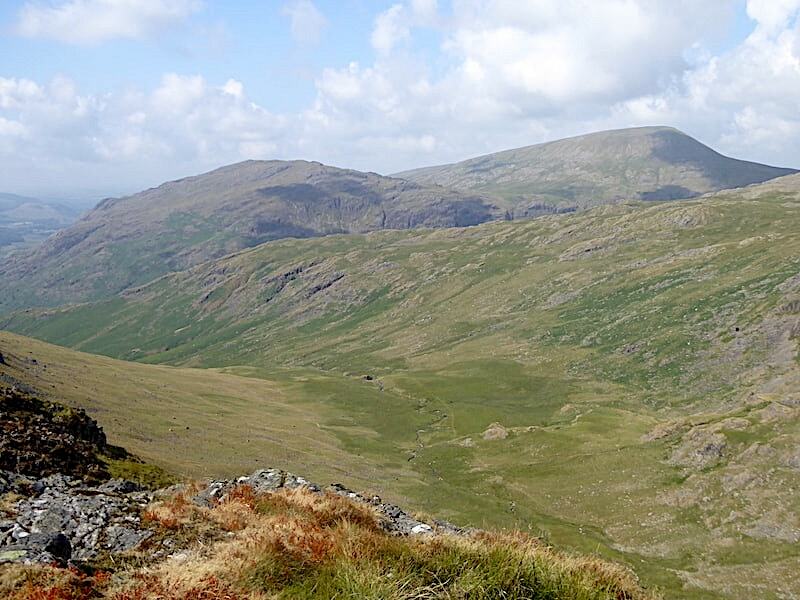 Carrying straight on meant that we kept our hard won height all the way to Dore Head, where the col can be seen in the centre of the shot. Once again the path crosses a few bouldery sections but, other than simply being awkward to negotiate, there were no difficulties and it was a fairly straightforward walk across. Down at Dore Head and looking up at Red Pike. 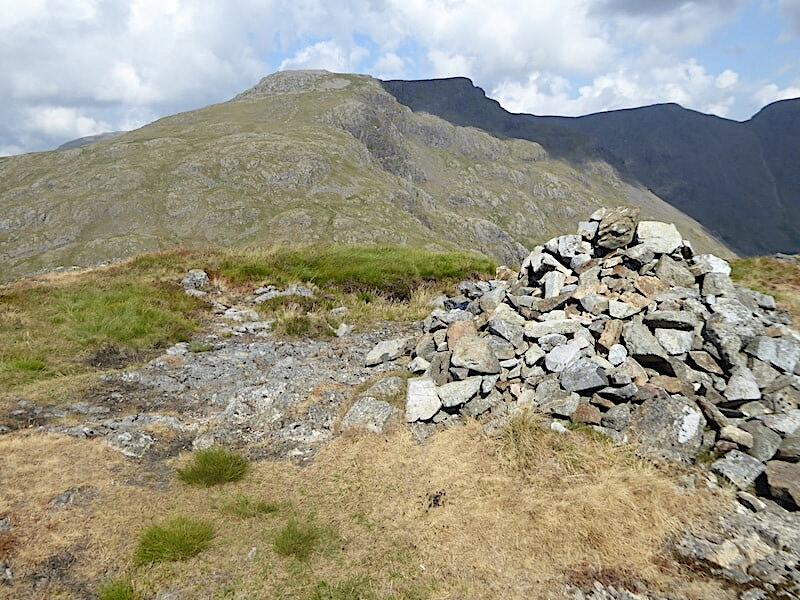 The summit is the high point towards the right of the shot so there’s a bit of way to go yet. 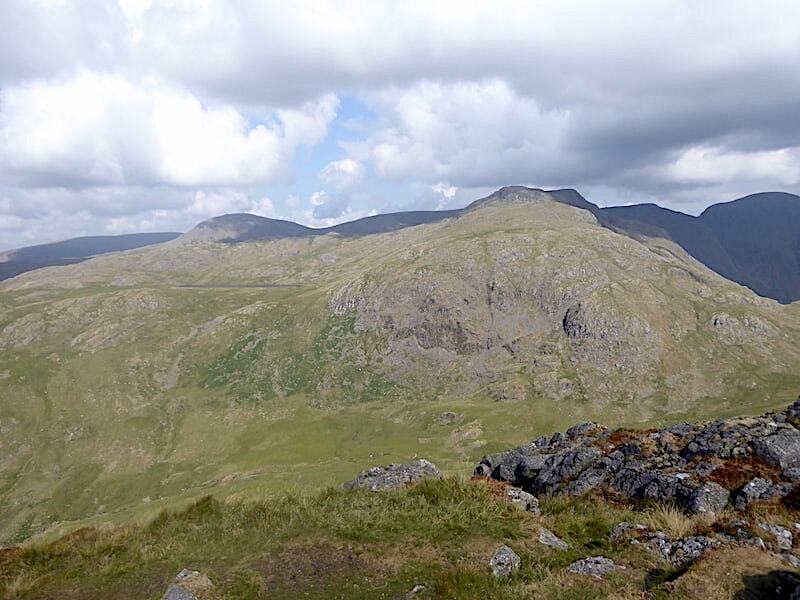 There is a very well trodden path up to Red Pike from Dore Head …..
….. so off we go and begin our climb up the steepish lower slopes of Red Pike from where I took this look back at Dore Head and the precipitous face of Stirrup Crag. 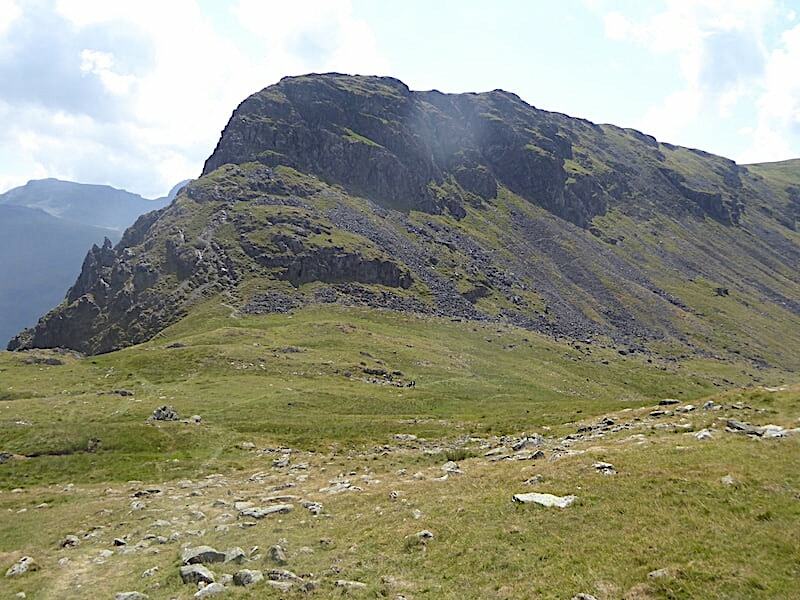 Over to the right of the shot is the depression along the ridge from where we began our descent and below the crags is the path traversing the slopes which led us over to Dore Head. 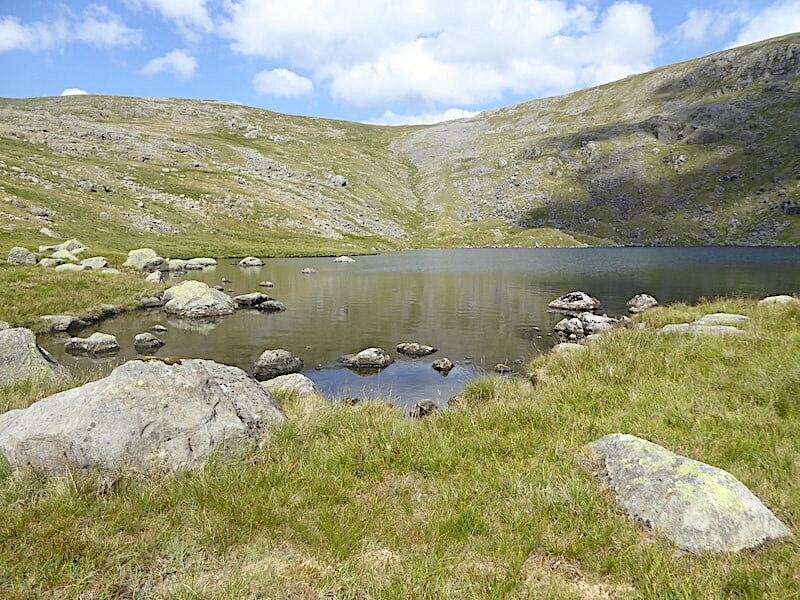 The little tarn at Dore Head has completely dried out. 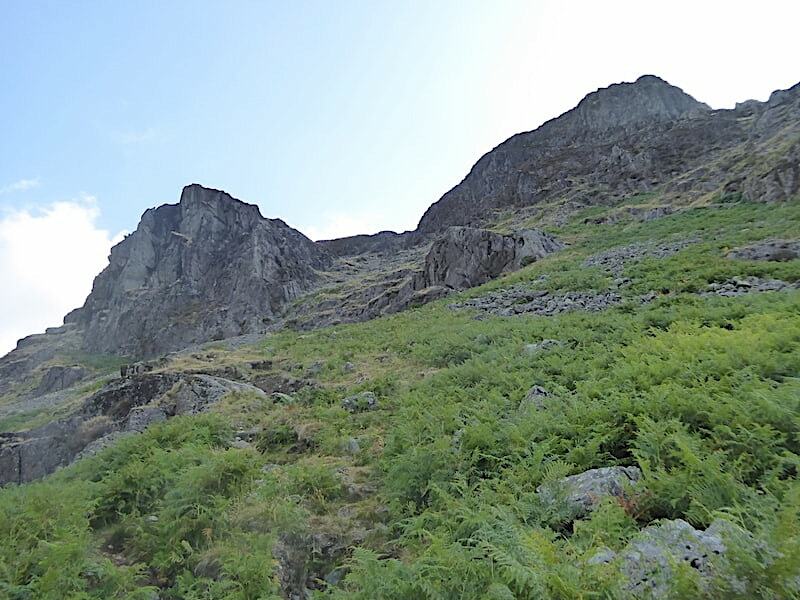 Another look back at Stirrup Crag as we sweat our way upwards. We have our backs to the sun and the breeze, for the moment, is much lighter now. We had expected to meet other walkers at Dore Head but there wasn’t a soul around. A solitary boulder above Gosforth Crag caught my eye on the way up which gave rise to one of those nonsense scenarios in which the little boulder is gazing across at Yewbarrow and thinking ‘When I grow up I’ll be as big as that and then people will want to climb me as well.’ On a more down to earth level, a zoom in might reveal some of the route we followed down from the depression. Just a little further on from here we met two walkers, retired chaps I thought, who were glad of the chance to stop and have a chat. Both from just over the border in Scotland and one of whom was trying to complete all the Wainwrights, with about eight still to go. The other one was only along to keep him company, I think, but both were very entertaining to talk to and lots of banter was exchanged between the two of them. 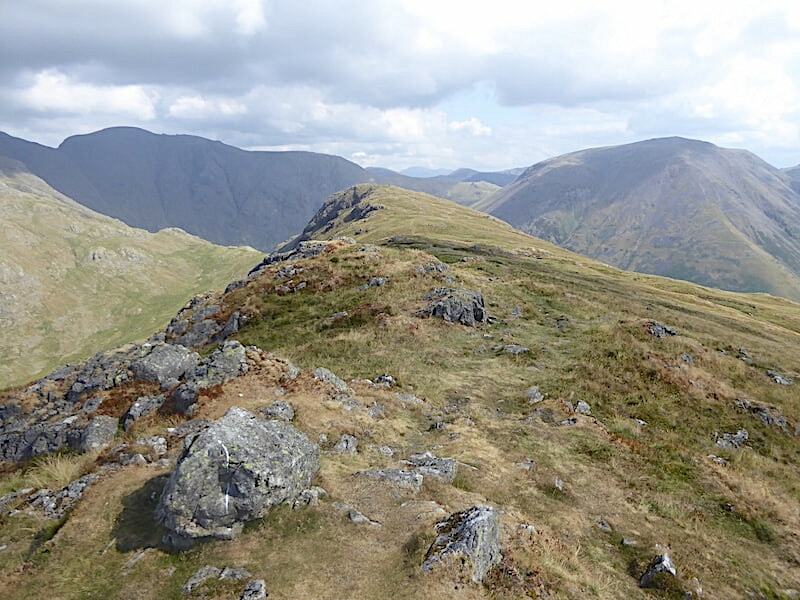 They mentioned that on the way to the summit they had been passed by two fell runners. 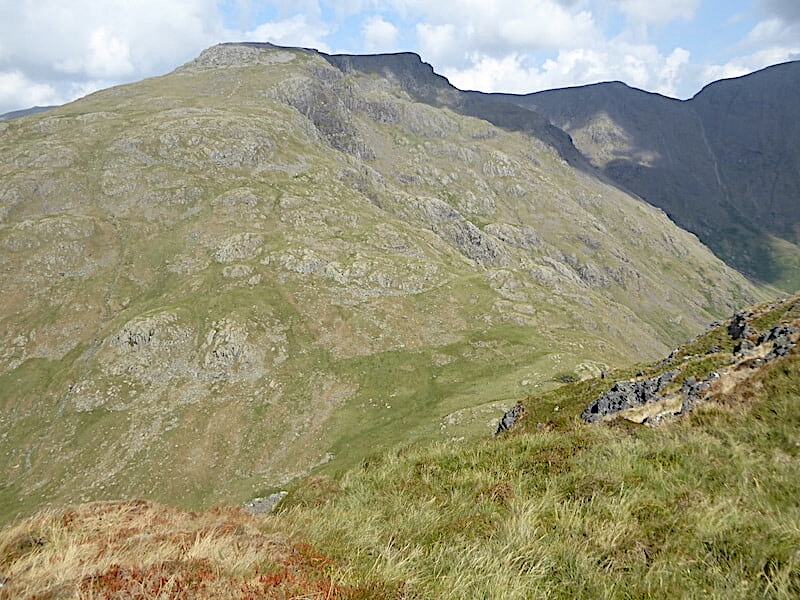 After comparing descriptions we knew that they were the same two who we had met when leaving Stirrup Crag. 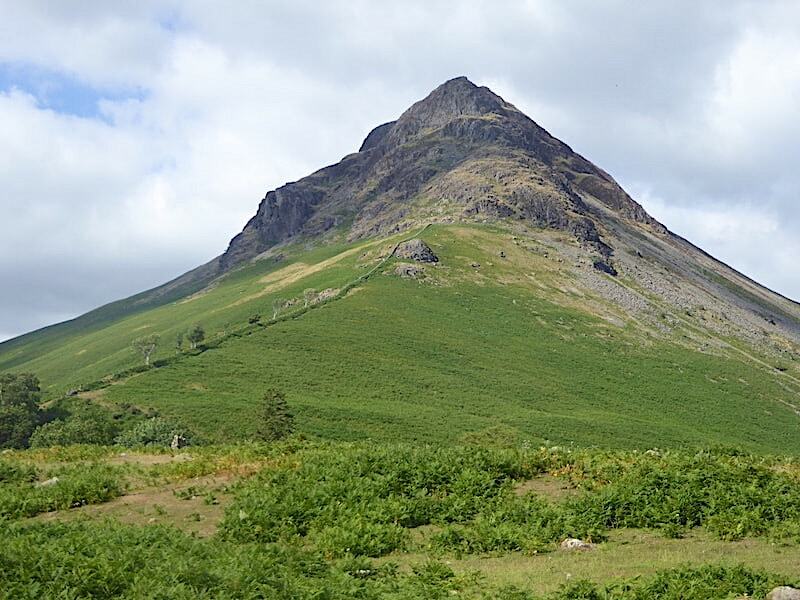 “How the hell did they run down there?” asked one of the walkers, pointing his walking pole at Stirrup Crag. “No idea” we replied, “We didn’t even walk down it.” We had a good few minutes chatting away before taking our leave and wishing them well on the rest of their walk. 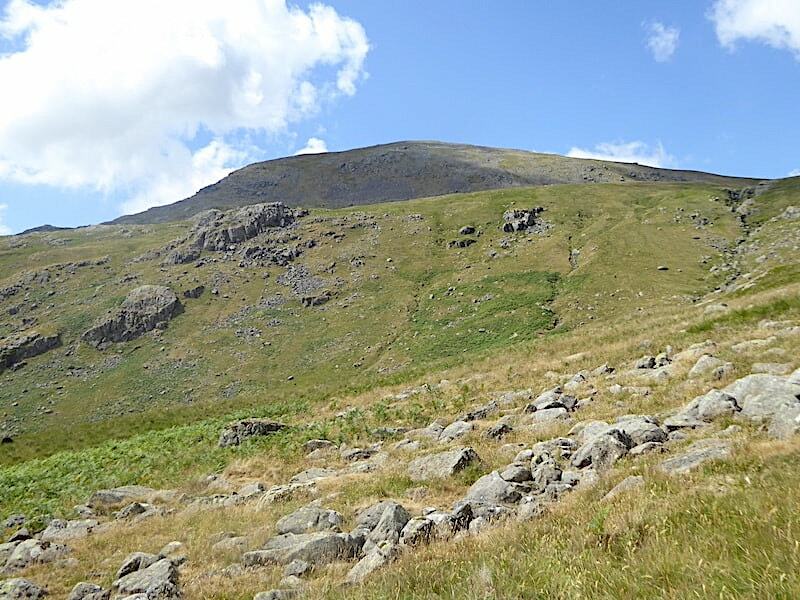 We reach the flatter area above the initial steepish slopes, stop for a breather and turn round to find the Scafells and their neighbours showing a little more definition than they have so far. 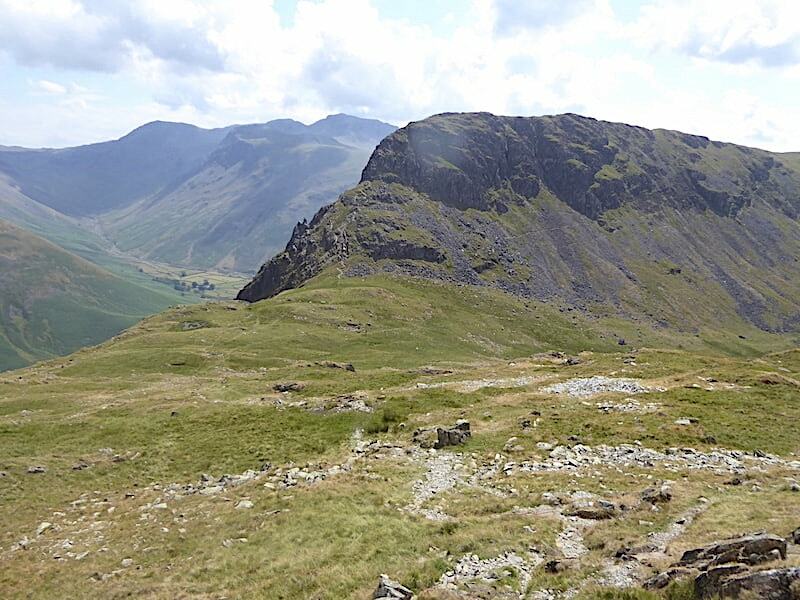 Its not a good photo but at least its possible to identify individuals, on the left of the skyline is Great End followed by Esk Pike, Scafell Pike and Scafell. 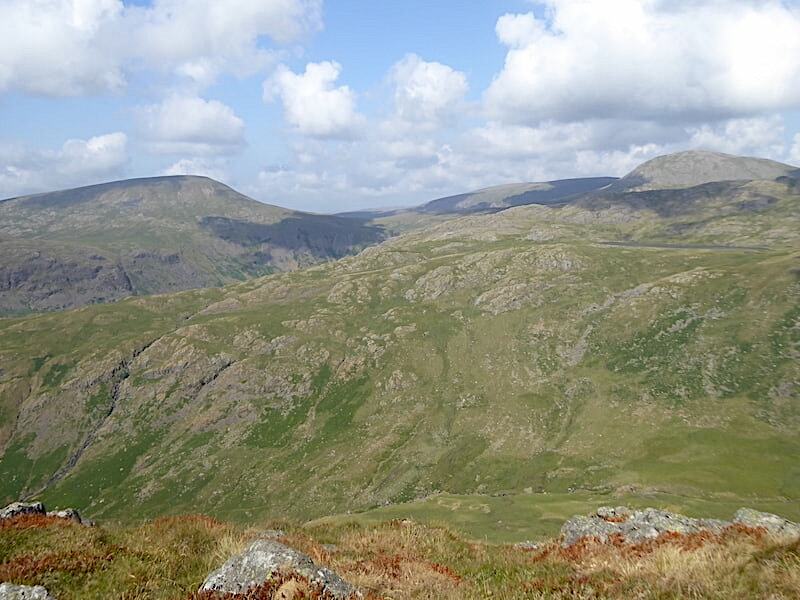 Lingmell is the fell occupying most of the centre below them all. 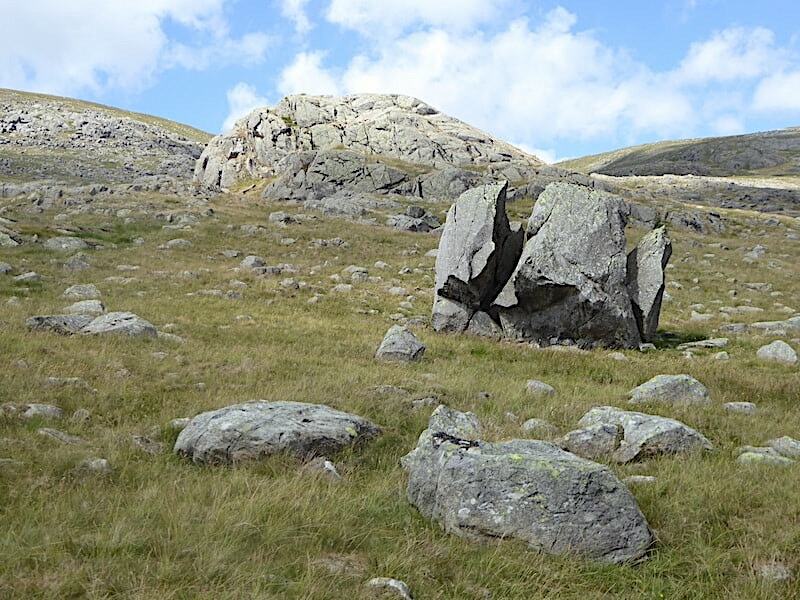 Still following the path and heading upwards to the south top where, a little higher up, we leave the path, head westward across the boulders and make our way towards …..
….. 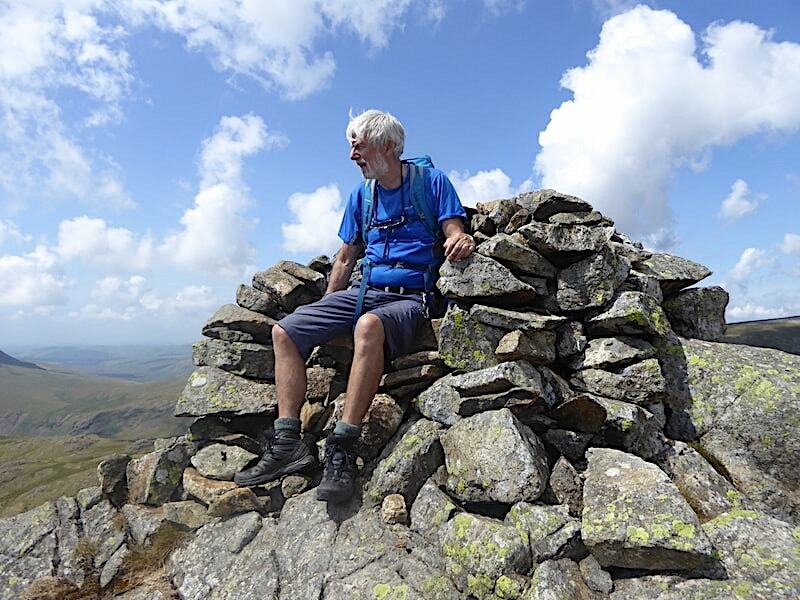 The Chair, a cairn on the south top which has been fashioned into a wonderful seat complete with backrest and armrests and from where you can sit in comfort and …..
….. take in the stunning view. 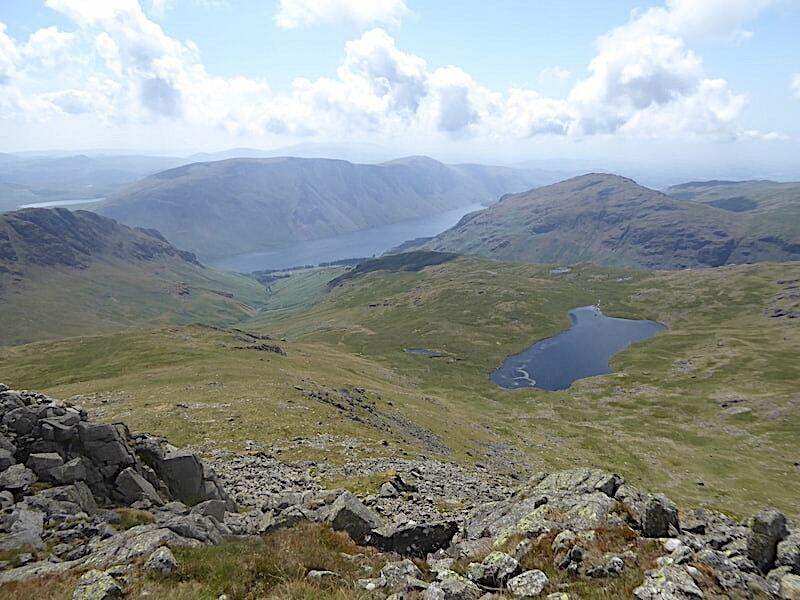 From left to right, three bodies of water, Burnmoor Tarn, Wast Water and Low Tarn. 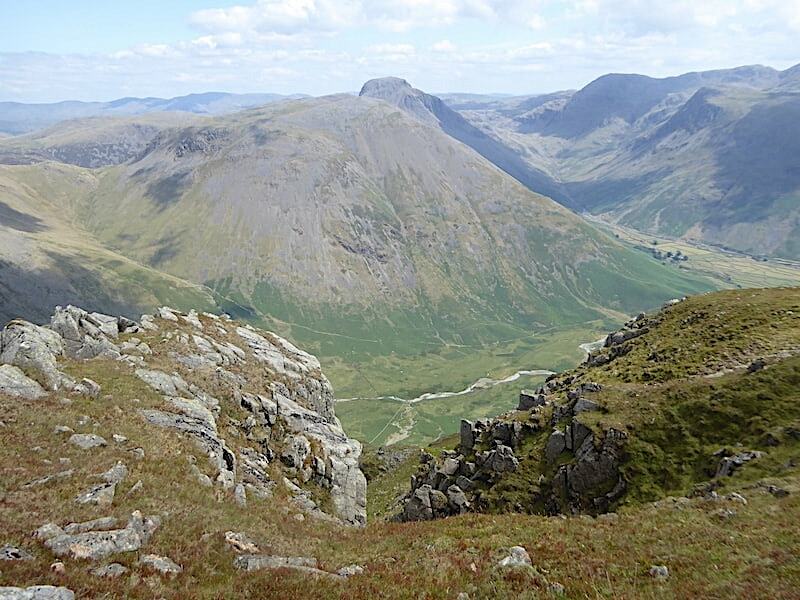 Yewbarrow is over on the left above the Overbeck valley, behind it is the Illgill Head to Whin Rigg ridge, while to the right of Wast Water is Middle Fell. Without the haze there would be more fells on view but what we have displayed below us is more than enough to feast the eyes on. A wonderful reward for our efforts. We take turns in the Chair where there is room for one tall person …..
….. and probably room for two smaller ones. It was just fabulous up here. We couldn’t have timed things better if we’d been trying, we arrived just one minute shy of one o’clock with stomachs telling us to stop and fill them with some lunch. It was a little too breezy to stay in The Chair so we tucked ourselves into the little grassy niche on the right and settled down for a very welcome break. We had a twenty minute break and before we continued on up to the north top I took a look behind The Chair over towards Scoat Tarn and Haycock. 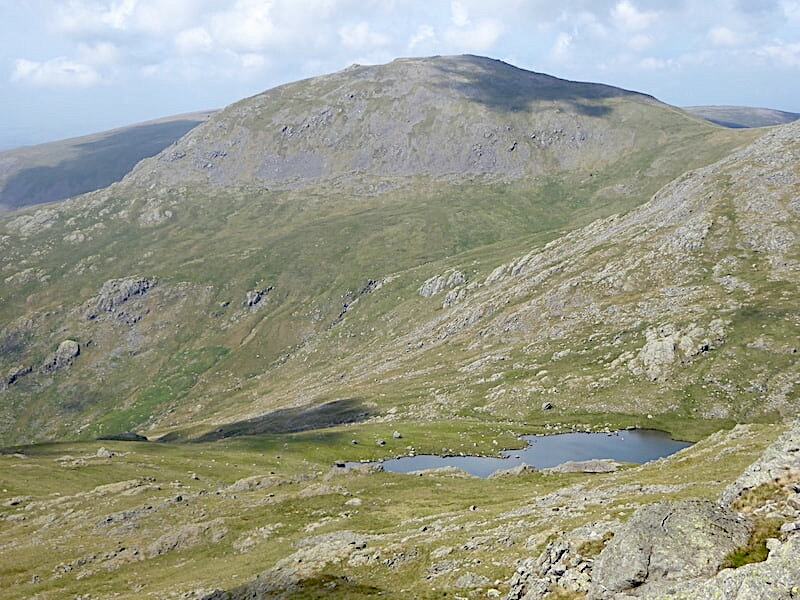 When we leave Red Pike’s northern top we will return via Scoat Tarn and then down beside Nether Beck. 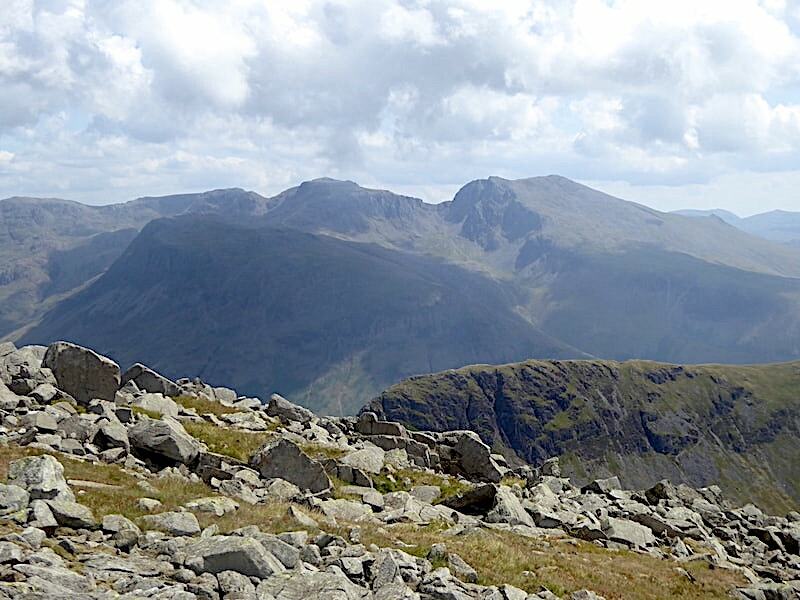 Still on the south top with another view of the Scafell group. It was still impossible to get much definition but I think things were improving gradually. From the south top to the north top is nothing more than a short grassy stroll where keeping to the edge provides some breathtaking views. 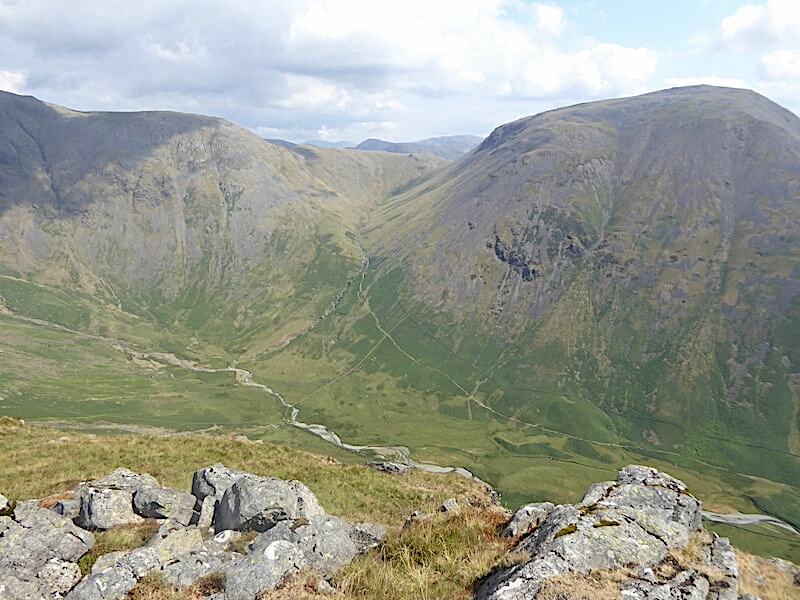 This is looking straight down into Mosedale with Kirk Fell stealing Great Gable’s limelight for the moment. 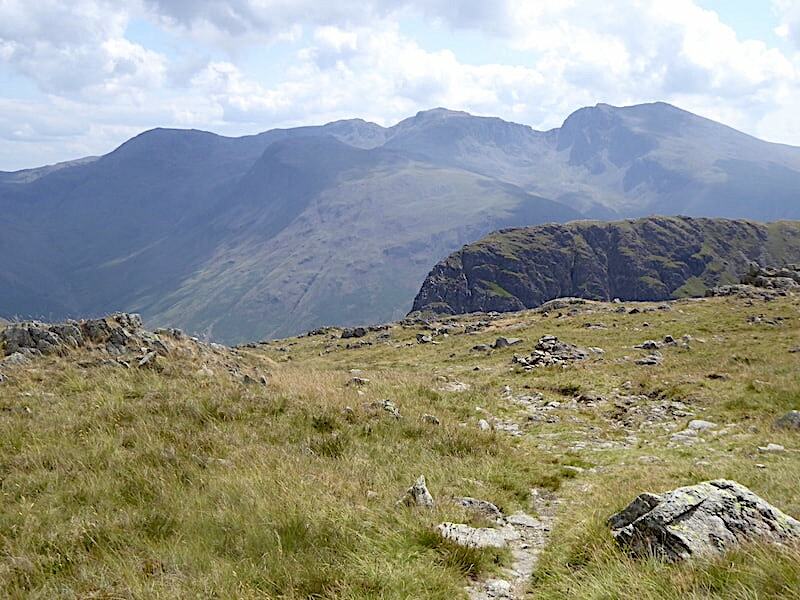 Looking back to the Scafell group once again. Along the way a series of gullies keeps the interest as the views below change ever so gradually. 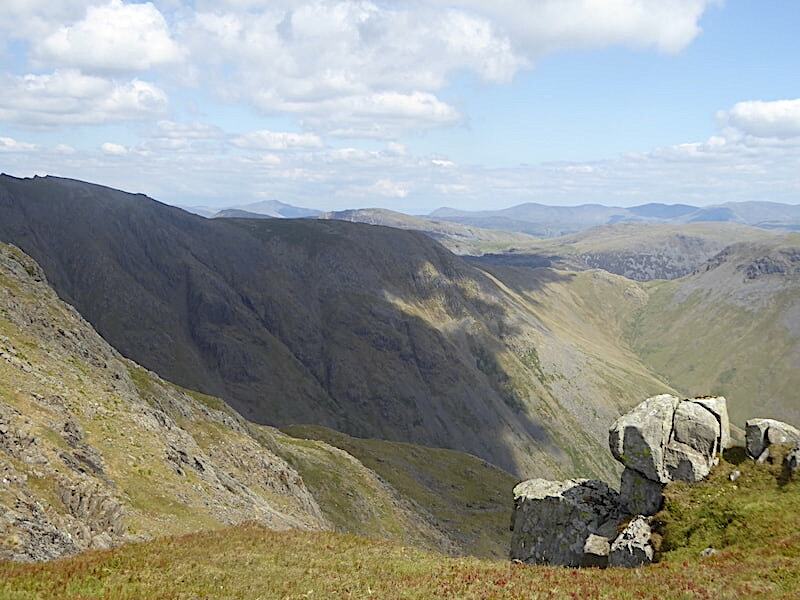 Black Sail Pass in the sunlight with a view of Blencathra on the left skyline, with Clough Head and The Dodds over on the right one. 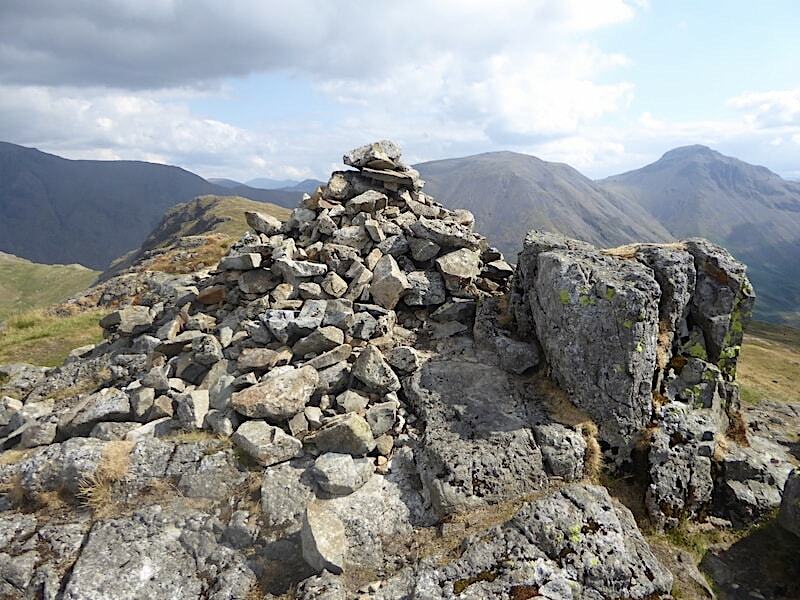 The sunshine deserts us as we reach the summit cairn, perched right on the edge of Red Pike, with a skyline view of Scoat Fell and Black Crag beyond. 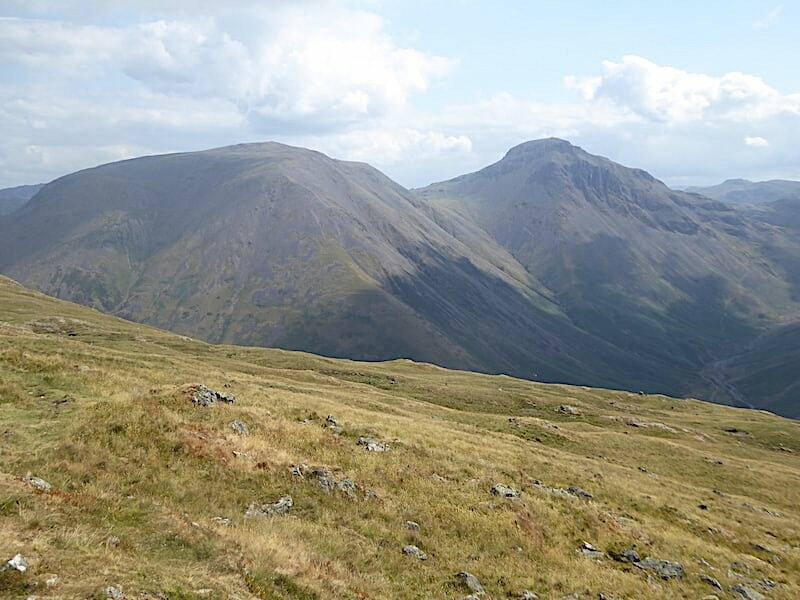 Looking eastward with The Dodds to the left and Great Gable to the right. For obvious reasons there will be no view of the cairn looking westward. My patience is rewarded and standing well back from another stomach churning drop I finally get a shot of a sunlit Pillar. Well worth the long wait. 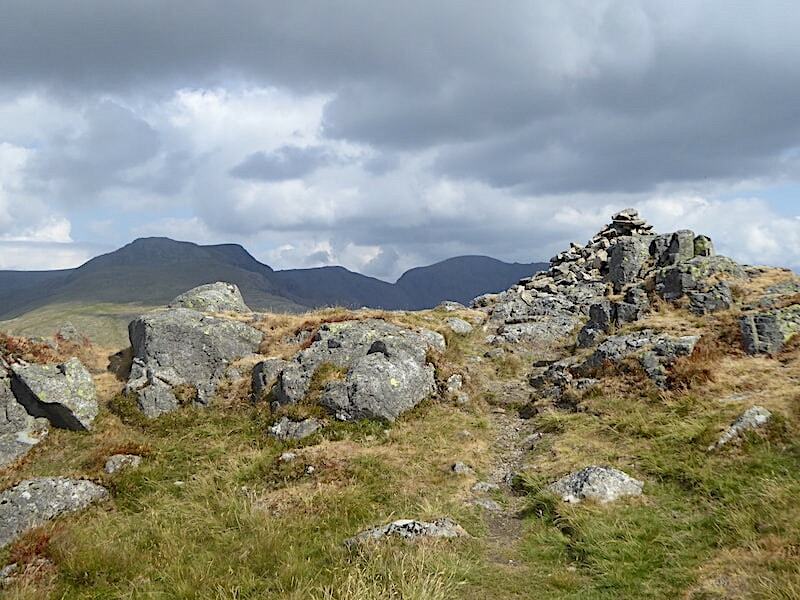 From the summit we take the Scoat Fell path, turn off it at the depression in between and make our way down towards Scoat Tarn. 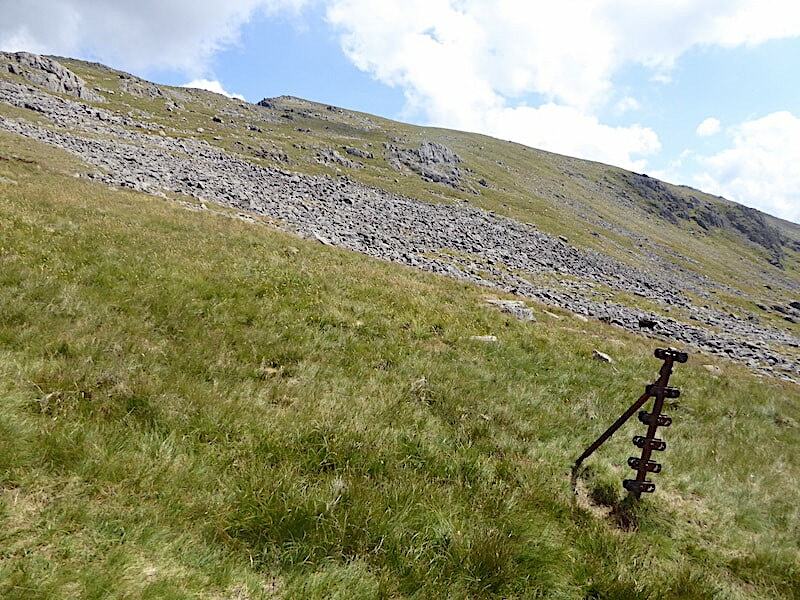 The old fence post is a handy marker to aim for and here we pick up the path, faint though it is, leading down to Scoat Tarn. 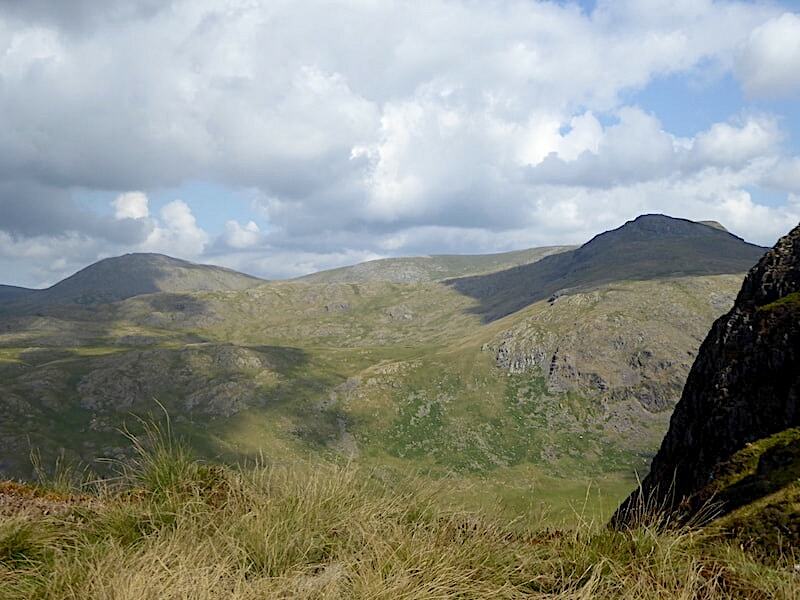 A look back up to Red Pike from the same fence post before we set off. 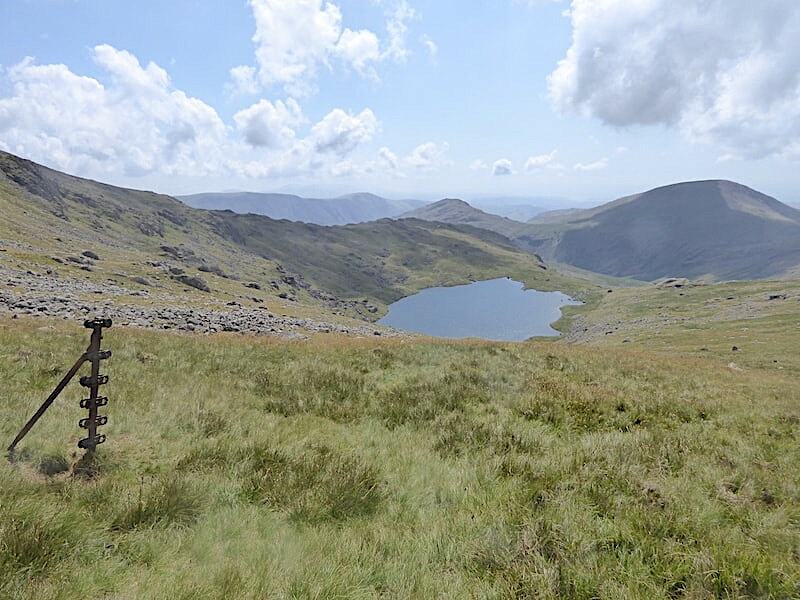 Down at Scoat Tarn where I took a look back at our route down from the depression between Red Pike and Scoat Fell. From this angle it looks quite a gentle descent but its steeper than it looks and is strewn with rocky patches and some bouldery sections. They were all avoided quite easily but it did make for a zig-zaggy kind of descent. 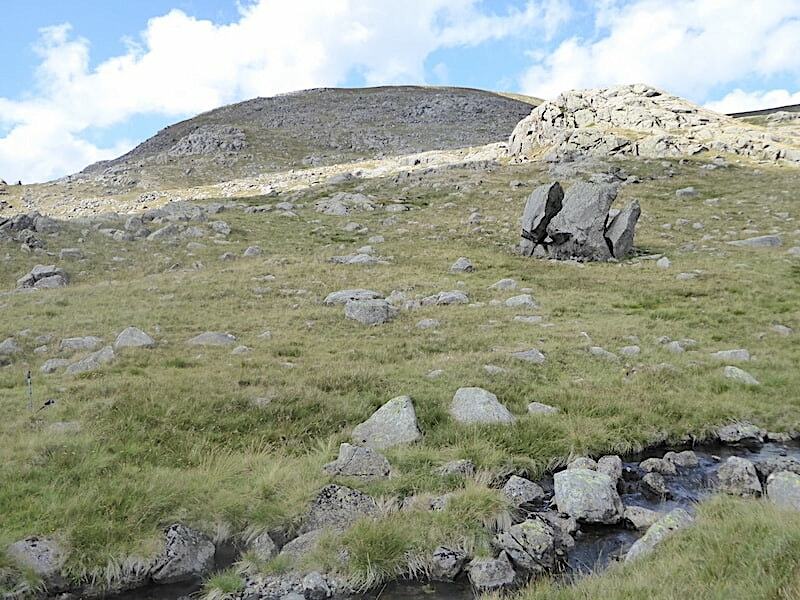 I hop back across the tarn’s outflow noticing this split boulder just a few yards away, the path runs very close by it and I hadn’t even noticed it. A closer look at the split boulder and we get to wondering how long it has been sitting here, how long has it taken for it to weather into its present state and how many more hundreds of years will have to pass before it eventually splits apart completely and its component parts simply fall to the ground to become just another common or garden group of stones. Perhaps such fanciful thought indicate that we’ve been out in the sun too long. Whatever the reason we take some more liquid on board and carry on down the valley. 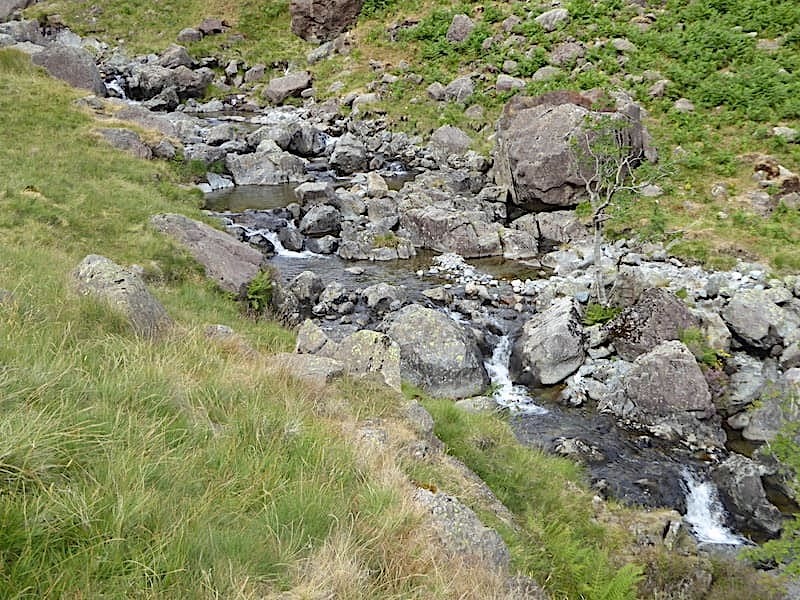 We more or less follow the line of the beck avoiding the rockier sections wherever possible now as J’s ankle, which he broke eighteen months ago, is not taking kindly to the uneven terrain and is beginning to ache a little. 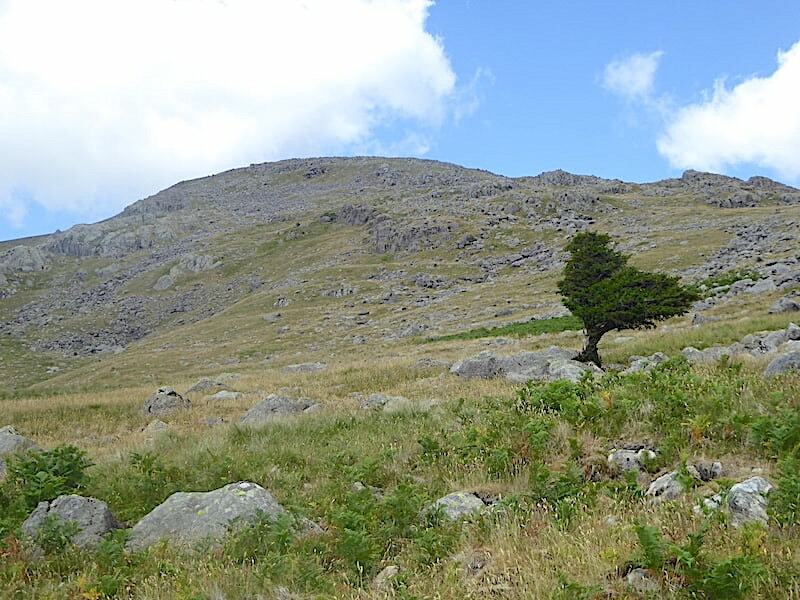 A single tree flourishing below the rocky slopes of Scoat Fell, a juniper we thought although we didn’t get close enough to make a positive ID. Views of Haycock are gradually diminishing as we drop further down into the valley. The foreground rocks indicate the nature of the terrain all the way down. Apologies for the blurry photo, which shouldn’t have happened given that I know I was standing perfectly still and there’s hardly any breeze down here, and with an anti-wobble widget on the camera too. I wouldn’t normally include it but it is close to the point where the path veers over to cross the beck and join the path coming down from the col between Scoat Fell and Haycock so its a useful marker for anyone following the route. Once we’d crossed the beck, removed all the scratchy bits of grass from our socks and had something to drink we checked the time and noted the mileage thus far and set off again. We noted those details because we wanted to see how far it was, and how long it would take us, from that point down to the point where we would cross over the beck again and return to the car park. 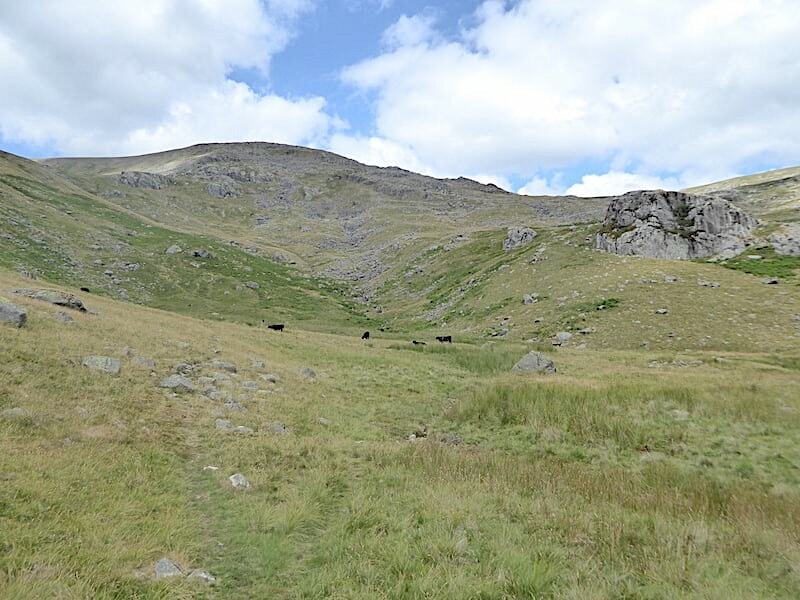 Once again the path mostly keeps company with Nether Beck and we have lost much of the steepness now so I take a look back at Scoat Fell and the Galloway cattle grazing below it. Still tramping the very rocky path above Nether Beck. Given the lack of rainfall we were surprised that the beck actually had water flowing down it and more than enough to provide some very pretty cascades along the way, and replace a couple of bottles of very warm water with some which was much more refreshing. Illgill Head comes into view and a smidge of Wast Water, if you peer very closely, but there is still some way to go along this very long valley. Just before we left the path to cross the beck for the final time we checked the time and the mileage. From the point where we took the initial readings we have walked three miles which has taken us one hour. Wouldn’t it be great if we could manage that going uphill? We left the path because it would have taken us back to Netherbeck Bridge and that would have involved a little bit more road walking than we really wanted to do. Crossing the beck and reaching the road on the eastern side of it would only mean a very short walk back to the Overbeck Bridge car park. This last bit of the walk was aided considerably by the presence of lots of heavy machinery being used to install a hydro-electric plant close by. Trackways had been made across the fellsides to enable the various machines to get to where they needed to be so we made full use of them, whether we were supposed to or not. 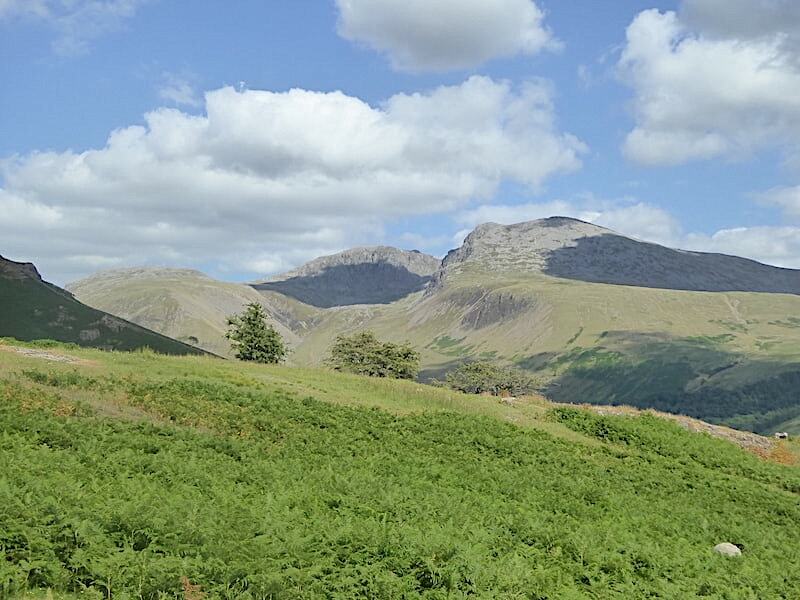 At long last a sunny view of the Scafells as we walked down the slope to the road, better late than not at all I suppose. The machinery trackway which we made full use of all the way down to the road which is hidden in the trees at the bottom. 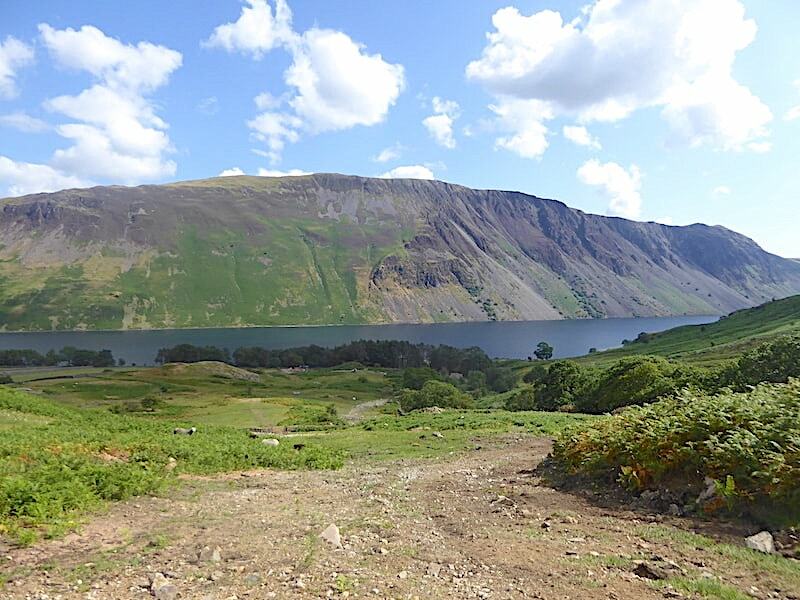 An unexpected route which gave us this lovely view of the dramatic Wast Water screes nicely lit by the afternoon sun. 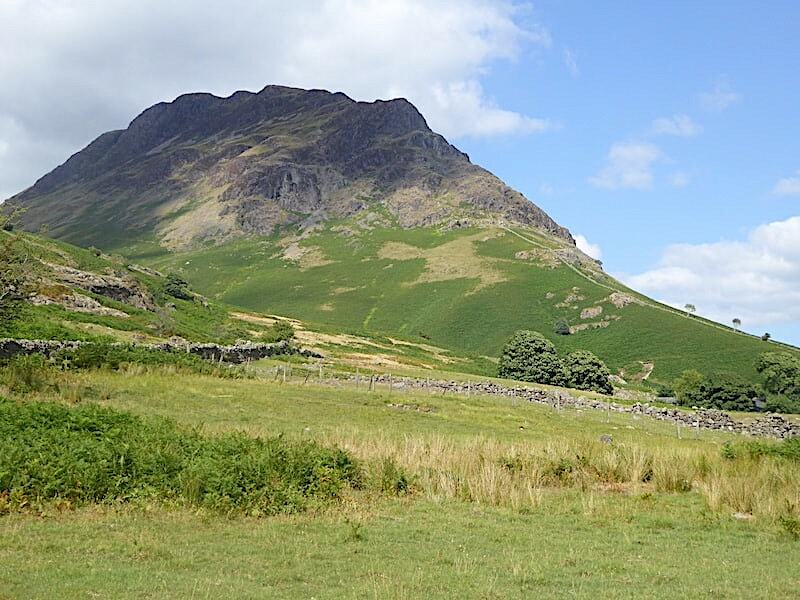 Across the fields a view of Yewbarrow which we began climbing some eight hours ago …..
….. and a final view of Yewbarrow as we walk the very short distance back to the car park. 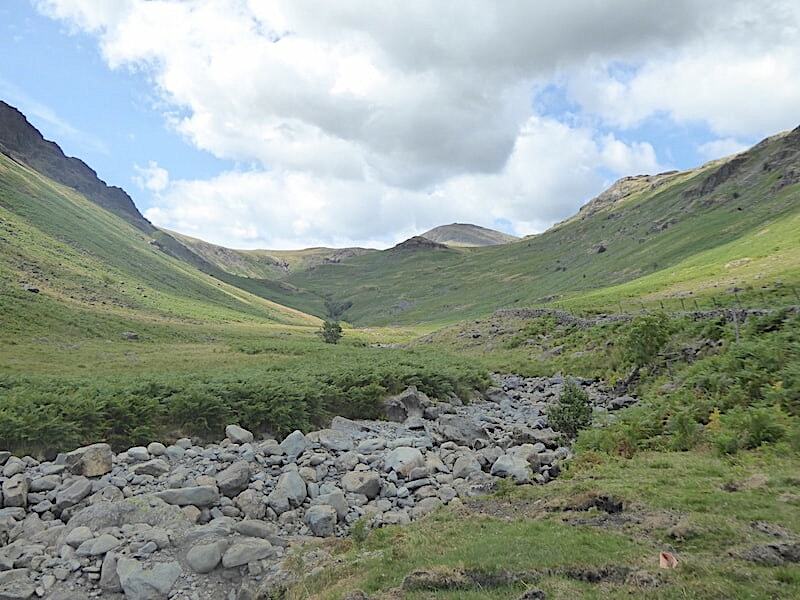 Its been a fantastic walk in more lovely weather and it was just great to be back in Wasdale once again. 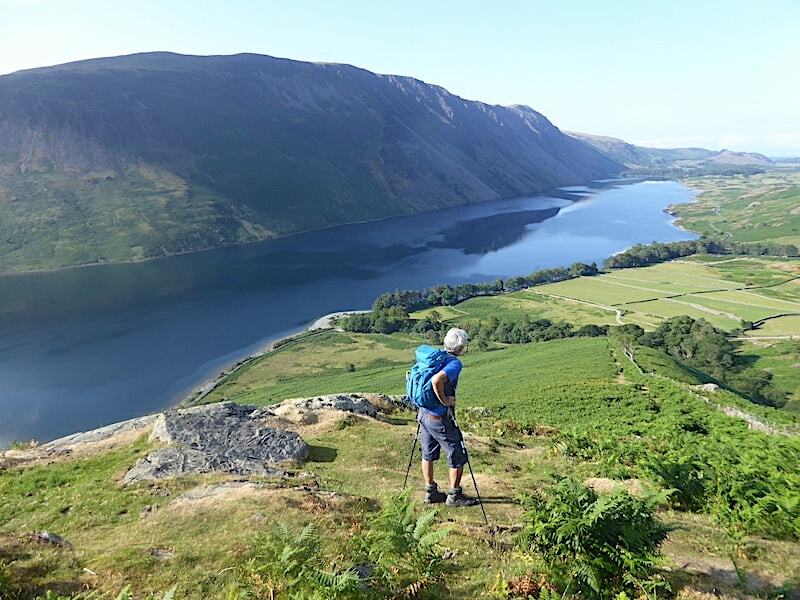 Yewbarrow is a wonderful fell to climb having lots of interest, but nothing really scary, along the way and provides some amazing views wherever you happen to be standing. 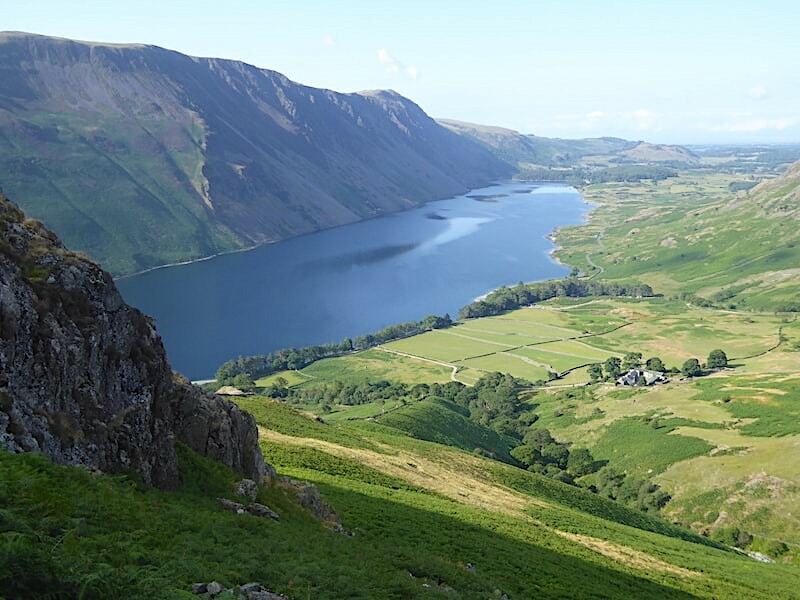 Its well worth getting up early to walk the fells around Wasdale but it would be nice if it wasn’t quite so far away.